Distinguished English manor blends new world amenities with old world quality in Memorial school district. Design features include tiger oak wood floors, Versailles travertine, Rumford fireplace, casement windows, elliptical & groin vault ceilings, iron staircase, high end appliances and much more! 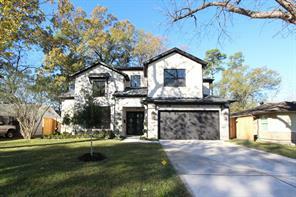 This custom built home is situated on a huge corner lot in desirable Spring Branch. Excellent central city location w/ easy access to I-10, minutes from downtown, Memorial City, City Centre, Town & Country, Energy Corridor and Memorial Hermann Medical Center. Pristine and well maintained home nestled in Hilshire Park, surrounded by mature trees, across from Moritz Pech Family Park, home boasts hardwood floors, granite counters, ss appliances, high ceilings, crown molding, elevator, beautiful custom built in bar over looking family room, plenty of storage, treetop park views, and much more! 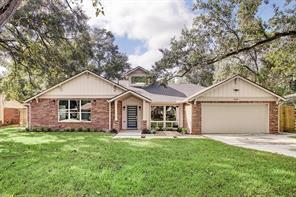 This home is zoned to desirable SBISD schools and is located in a prime location w/ easy access to I-10, Memorial Herman Medical, Downtown, Energy Corridor, restaurants, shopping, etc. Meticulously designed steel framed contemporary Mediterranean home overlooking Westview Drive on a generously sized 35,000 sqft lot boasts 6 bedrooms, 6/3 baths, and garage space for 7 vehicles. The 10,000 sqft grand main house provides two first floor bedrooms (master and a large secondary), grand formals, exercise room, media room, and inviting second floor balcony that overlooks the magnificent backyard grounds, temperature controlled wine cellar and a Texas-sized kitchen island that must be seen to be appreciated are just some of the fabulous features of this home. The garage apt is approx. 1,500 sqft., unfinished space, to be customized by buyer's specification. The home did not flood during the Harvey event. Room sizes should be confirmed by buyer. Meticulously designed steel framed contemporary Mediterranean home overlooking Westview Drive on a generously sized 35,000 sqft lot boasts 6 bedrooms, 6/3 baths, and garage space for 7 vehicles. The 10,000 sqft grand main house provides two first floor bedrooms (master and a large secondary), grand formals, exercise room, media room, and inviting second floor balcony that overlooks the magnificent backyard grounds, temperature controlled wine cellar and a Texas-sized kitchen island that must be seen to be appreciated are just some of the fabulous features of this home. Garage Apartment, approx. 1500 sq.ft. is being completed to have Spacious living/dining .Service Kitchen, 2 Bedrooms, 1 full bath, storage closets, Full "Pool" bath down and 3 car garage below.The property is totally fenced and has electronic controlled wrought iron gate, entering the property. Owner to clear lot before closing. 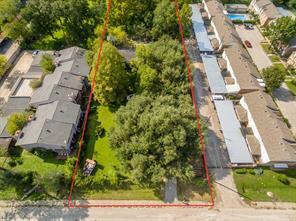 Large parcel in rapidly growing Spring Branch area. Many options for this property. See documents and call with questions. 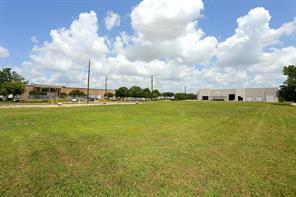 10,000 SF Medical Office Building on 1.14 AC of Land on Northwest Freeway (US-290). The property provides access to both Bingle Rd. Lang Rd. & US-290. The site is excellent for a medical practice and/or ready to be redeveloped. All condemnation has already taken place at this site. The area offers impressive demographics with freeway visibility. Traffic counts exceed more than 200,000 cars per day. 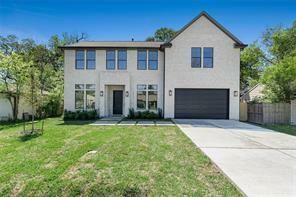 Beautiful new construction home located in Spring Branch, just minutes away from the Galleria, Memorial City Mall & City Center; will offer high-end finishes & details throughout. Features include custom furniture-style cabinetry, marble counter tops & wood flooring. Features a 1st floor Master & Study, 2 Game Rooms, a 2-car garage & a 1-car garage. Kitchen will include extensive cabinetry space & a high-end Thermador appliance package including: a 48'' Range, Dishwasher & Refrigerator. Top rated SBISD -Valley Oaks Elem. 4 min. walk (Transfer agreement in place for Spring Branch Middle School). Sidewalks to schools, parks, restaurants &shops. 2010 custom build, loaded w/extras & features that will impress the most discerning buyers: Hand Scraped Oak Wood floors (manufactured on-site & installed as each piece was created) w/Granite inlays, perfectly complement the Brick Walls throughout 1st floor. Side-by-side Kohler Farmhouse Kitchen Sinks w/ Lace Pattern Apron Fronts. Custom Antiqued Cabinetry. Jenn-Air Cooktop w/Cast Iron French Fireback, Grill & Downdraft. Luxurious Master Suite. Artisan Crafted Woodwork throughout home: Fireplace Mantel, Pocket French Doors, Kitchen Window, Hand Crafted Exterior Doors, Carved Stairwell Spindles. Covered Private Patio area w/Fireplace & Outdoor Kitchen (gas grill/burners/sink) for Entertaining. Built-ins everywhere. 3 AC units (Master suite w/dedicated unit). Remote Entry Gated Driveway. Recirculating Hot Water. Enormous storage. 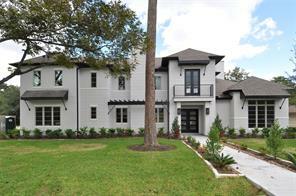 Stunning new construction from Live Oak Builders. 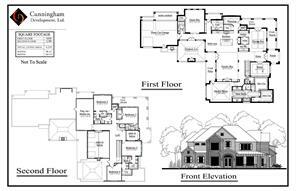 Sprawling floor plan with Master Suite, Study, Guest Suite, and Game Room ALL ON THE FIRST FLOOR! Fabulous house for entertaining. Beautiful unobstructed views from the rear of the house. Tons of natural light. 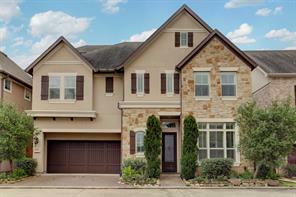 Zoned to Valley Oaks Elementary, Spring Branch Middle and Memorial High School! Beautiful Parge finish on the exterior of the home with tons of natural light throughout the house. 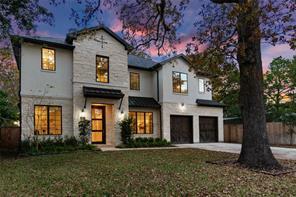 Come see this amazing new build in Spring Branch! 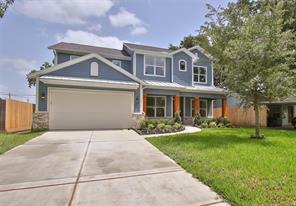 This beautiful, new construction home is located in Spring Branch & zoned to some of the BEST SBISD schools; Hunters Creek, Spring Branch Middle & Memorial HS. 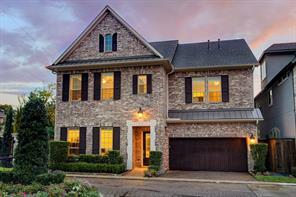 Home offers high-end finishes & details throughout. Features include custom shaker cabinetry, mix of marble & quartz counter tops throughout home w?wide plank white oak hardwood flooring. Features a 1st floor Master & Study, 2 Game Rooms, 3 car garage, 4-5 bedrooms. Home also offers Low-E Double Pane insulated Anderson A-Series windows, AC Zoning in 3 areas of home, dual tankless water heater w/re-circulation system, built in surround system in family room, kitchen, patio, and gameroom, Internet/Satellite/Cable Network wiring throughout house & custom alarm system, Wi-Fi enabled Thermostats and garage openers, and independent inspections on frame & foundation of house. Kitchen includes extensive cabinetry space & high-end Thermador appliance package including a 48'' Range, Dishwasher & Built in Panel Refrigerator & much more! 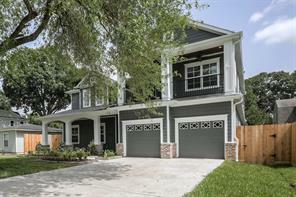 Stunning new construction from Live Oak Builders. Sprawling floor plan with Master Suite, Study, Guest Suite, Living Room, Formal Dining Room, Breakfast room, and Gameroom ALL ON THE FIRST FLOOR!!!! Fabulous house for entertaining. Beautiful unobstructed views from the rear of the house, with TONS of natural light! Zoned to Valley Oaks Elementary, Spring Branch Middle, and Memorial High School! Beautiful Parge finish on the exterior of the home. 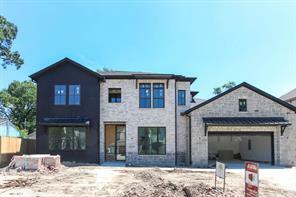 Come see this gorgeous new build by Live Oak Builders in Spring Branch! Beautiful house built on near one acre lot in the Spring Valley Area. This is a two story house with 5087 sqf, foundation is beam on Bell Bottom Piers with above code framing and insulation.It has 5 bedrooms and 5/1/2 bathrooms, Two master suits one one each floor. In addition it has a study,formal dining and living rooms, game and media room. Large kitchen with cooking and preparation space with two work areas plus a central aisle. Within the same area there is a large TV sitting and breakfast area. A three car garage is attached. There is a deep water well with water suitable for consumption but used currently only for garden watering purpose. Located within the Spring Branch Independent school district and is zoned to Valley Oaks Elementary, middle (Spring Branch Middle) and Memorial High school . Entertainer’s Delight! 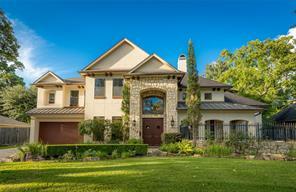 4BR/4.5BA home is situated on 1/2 acre corner lot in Monarch Oaks/Westwood Oaks & award-winning SBSID schools. From the custom paver drive thru the iron/glass front entry doors & into the Groin Vault Ceiling Entry Way w/Chandeliers your guests will be welcomed to unparalleled craftsmanship & exceptional amenities incl: 48” Viking Dual-Fuel 6-Burner Range & 2 Ovens, Viking Warming Drawer; Separate “Dirty” Prep Kitchen w/addt’l Dishwasher, Sink, Disposal; Plantation Shutters; fully-plumbed casita/guest/maid’s quarters. Relax in your over-sized resort style master bath where the water is heated from one of 2 50 gal hot H2O heaters. Your family and loved ones will enjoy the spacious fenced backyard, perfect for family gatherings w/outdoor kitchen, FP, 2 outdoor TV’s & a heated negative edge pool w/ built-in Star-lights & huge custom pool deck. Too many amenities to list. Schedule a showing thru your real estate professional and begin planning your summer BBQs today! 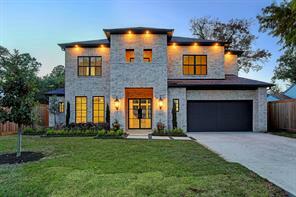 Stunning new completed custom home on a large corner lot. Solar panels installed to reduce energy bills. 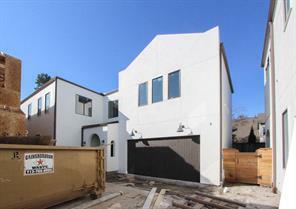 Striking stucco elevation w/ 3 car attached garage. Exceptional open floor plan with large living area with gorgeous tiled fireplace and huge picture windows overlooking landscaped yard and outdoor kitchen area. Soft contemporary interior with high ceilings, hand crafted built-ins throughout, hardwoods upstairs and stone floors down. Incredible kitchen features an expansive island with breakfast bar, quartz counter tops, Wolfe appliances and Sub-Zero frig. Wet bar with Sub-Zero wine frig and wine storage off kitchen. Smart Home system with cameras, alarm and climate control . Master bedroom has beautiful ceiling, HUGE custom closet and stunning tile design in large shower. 1 bedroom down with full bath, study and safe room down. Game room, 3 bedrooms and extra room/nursery upstairs. Surrounded by New Construction, this property is perfect for a New Home Community, Townhomes, or Redevelopment of any kind! 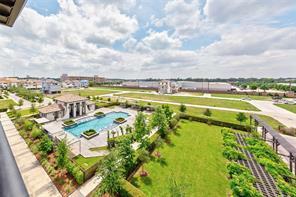 Easy access to Beltway 8, I-10 and Highway 6. Minutes from City Center and Memorial Mall. All remodeled 6 units of 3 Bedrooms town home. fully rented total unit rent; $8300 a Month. Each unit has 1 garage and cover carport. 6 units of 3 bedrooms. There is extra land of 33,384 sf for more for to be built. 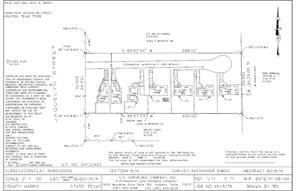 Seller has blue prints for new to be built 3 units of 1752 sf 3 bedrooms and 3 units of 2150 sf 3 bedrooms units. Good investment opportunity! 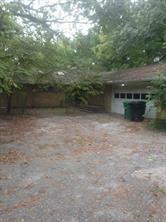 9110 and 9112 Spring Branch Drive Sold as one lot. 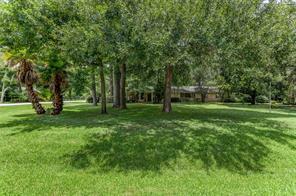 Great opportunity to own just under 2 acres in very desirable Spring Branch. This property currently is being rented, but would make a PERFECT location for TOWNHOUSES in the $300-500K price range. 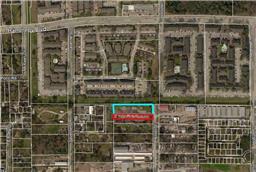 We estimate 21 or more units could be accommodated on this lot. Just across the street from other new construction, Spring Branch Creek, and Historic St Peters Church (one of the oldest in town, 1848). 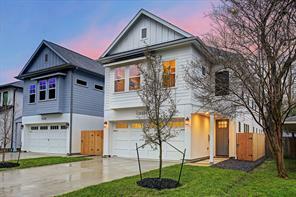 Close to Spring Valley schools, and minutes away from Memorial City Mall and City Centre, central to HEB and Kroger, and many great Spring Branch/Memorial/West Houston Restaurants. Dramatic TWO-STORY STUDY is just one feature of this stunning home in Ravenna, Lovett Homes' LUXURIOUS GATED community at the end of a quiet cul-de-sac near the prestigious Awty International School. Amenities include a 77' RESORT-STYLE POOL and oversized DOG PARK. Zoned to MEMORIAL HIGH SCHOOL! 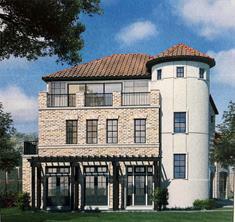 Tuscan inspired architecture with gorgeous finishes and FIRST FLOOR LIVING has FENCED-IN COURTYARD. CORNER LOT. Home will have elevator installed. Kitchen to have 48" Thermador Pro Harmony Range. This home is under construction, but is very walkable. Almost every selection can still be made to make this home uniquely yours. 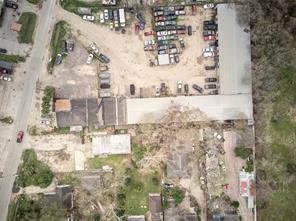 HIGH & DRY during Harvey. Stunning 2-story foyer opens into gorgeous, meticulously designed custom home with every conceivable luxury: personal sauna, wood-fired pizza oven, 600 bottle climate wine cellar, en suite bath in all bedrooms, Thermador gourmet chef’s kitchen with stainless appliances, 2 sinks, 2 dishwashers, “Column” refrigerator and freezer, double ovens, warming drawer. 1st floor master suite has breakfast bar, luxurious bath, his & hers closets, easy access to laundry. Huge screened-in porch and summer kitchen with refrigerator, infrared grill, Thermador exhaust, Viking oven, sink, fireplace and tv, overlooks the lush, park-like yard with spa, fire pit and whimsical bronze sculpture. 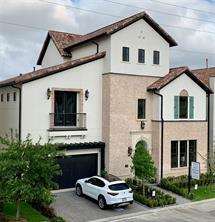 In desirable Spring Branch area, every amenity incorporated for beauty and efficiency: Energy Star rated, SmartHome equipped, elevator-ready, age-in-place features, central vacuum, art lighting, metal roof. Built for family comfort and expansive entertaining, this home has been meticulously maintained like new. Selling for lot value only! Would make a great location for a Town home development. Includes 2 lots. Survey and information provided on the flyer. LOCATION, LOCATION, LOCATION! 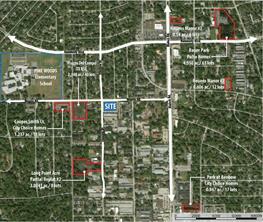 Wonderful Spring Branch (1.9935 acres) lots ready for development! Mature trees are sprinkled on the lot. Ideal for investors, developers and builders! Located conveniently off of Long Point between Bunker Hill and Blalock provides for easy access the Katy Freeway, City Centre, Memorial City, HEB, hospitals and LOADS of dining! Property is 3 different lots but being sold as one tract. Tax ID: 067-045-005-007, 067-045-005-0052 and 067-045-005-0008 or 1612, 1614 and 1620 Oak Tree. Call today to see this wonderful property! 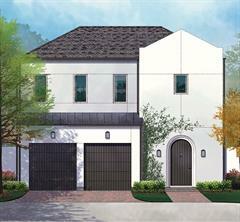 Ravenna offers the exclusivity of living in a GATED community of new homes ranging from 2,250 sq.' to 6,000 sq.' just minutes from downtown Houston, the Galleria, and the Energy Corridor, with amenities that include a 77' RESORT STYLE SWIMMING POOL and oversized DOG PARK. Named after a charming Italian village. Ravenna's barrel tile roofs and lavish landscaping wows. This great floor plan, with first floor living and 12' ceilings, offers three bedrooms (including master) on second floor, and a fourth bedroom and game room on third floor. Game room has wet bar and opens up to fabulous 22' x 14' covered roof top deck with an OUTDOOR FIREPLACE. Lovett standard selections will include marble counter tops, 7-1/2" wide plank wood flooring, and Miele German stainless-steel kitchen appliances. Purchase now to make your own unique selections at our design center. 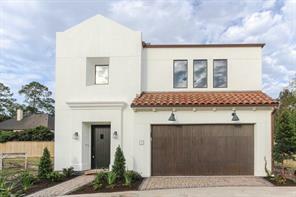 Come tour this stunning home located in the gated community of Ravenna. The seller spared no expense on the upgrades in this smart home. The interior features include: white carrara marble, surround sound, remote operable window coverings, RH hardware, chandeliers, elevator, fully air conditioned garage with finished floor, cabinets and mud room style lockers in the garage, fully mirrored yoga room, water & air filtration systems, La Grand light switches, 2 dishwashers, designer faucets, custom seagrass rugs and much more. 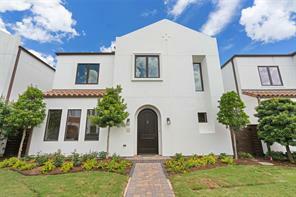 The exterior features include a Santa Barbara inspired stucco facade, gated entrance to the front courtyard, fountain, corner lot, wrap around balcony on the second floor, a private pool & outdoor kitchen in the backyard, beautiful landscaping, mosquito spray system, SUV parking abilities in the driveway and garage. There is also a backup generator that operates the entire home. Located on a large 8,892 sq. 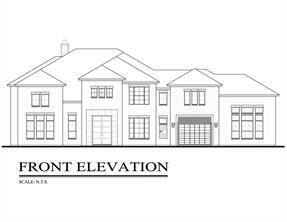 ft. lot, this new construction home by Quintessa Homes features 4 bedrooms 4 full baths, 2 half baths with a beautiful circular staircase, 20 ft ceilings, a first floor Master and second floor Game Room & Media Room spaces. High-end finishes include custom-site built cabinetry with natural stone counter tops & 8' inch baseboards throughout. Kitchen features a Thermador Gas Range, SubZero Fridge & KitchenAid warming drawer. Seasonal storage closet neatly hidden behind a built-in bookshelf on the 2nd floor. Home also offers a full sprinkler system, alarm pre-wire, home automation pre-wire and speaker pre-wire. Large backyard includes a deep covered back porch with an outdoor kitchen including grill and sink, plenty of room for a pool and so much more! 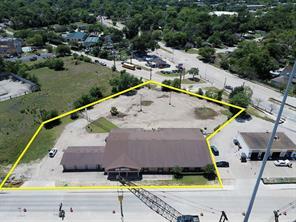 Large +/- 32,670 sft Lot on Prime Spring Branch location. New development all around. Spring Branch School district zoned to Memorial High School. Developers - buy now and build later or buy and use as office or storage for your other projects. This gorgeous TWO-STORY stucco home features a THREE-CAR GARAGE and FENCED IN YARD that measures 21x21, offering plenty of ROOM FOR A POOL. Oversized secondary bedrooms (13x18) both have large walk-in closets. Buy soon to make almost every single interior selection, so that this home can be uniquely yours! 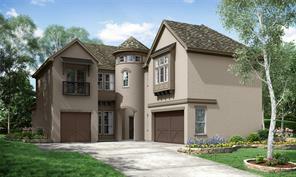 Ravenna is Lovett's premiere gated community located in Spring Branch. This hidden gem, just minutes from downtown, The Galleria, and the Energy Corridor, provides quiet exclusivity in an Italianate setting. Barrel tile roofs, stucco and brick of various blends, and lush landscaping dapple this stunning neighborhood. The resort-style 77' pool with cabanas and club house are a perfect spot for winding down at the end of the day. And the oversized dog park gives your furry friends plenty of space to run off leash. 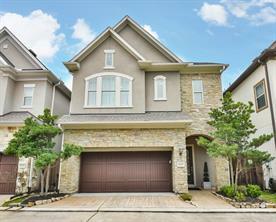 Gorgeous 5 bed 4.5 bath with both master and guest suites downstairs. Soaring two-story ceilings and windows in the living area lend an openness you'll love. The floor plan flows easily, featuring two stairways and a large chef's kitchen with multiple eating areas. The butler's pantry with ice maker, sink and wine chiller makes entertaining easy. Stately moldings and ornate trim detail throughout. A luxurious pool and spa in back are the perfect private getaway from Houston heat. Brykerwoods is a pedestrian-friendly, close-knit community which many residents have loved for years. 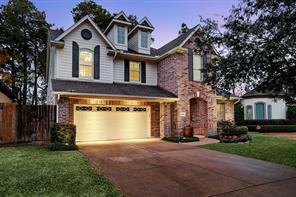 Zoned to the highly acclaimed Hunters Creek Elementary, Spring Branch Middle and Memorial HS. A must see! DID NOT FLOOD DURING HARVEY! Custom Built one of a kind home. The open floor plan includes an over sized kitchen, fantastic for large gatherings. The home opens to the back patio and opens to the garage and can be converted to part of the outdoor living space. Laundry room includes a dishwasher and a farmstyle sink for desecrate clean up. The library on 1st floor has a bath with shower and is ideal for families on different schedules. This flex space is set up to be an office or an extra bedroom. Upstairs there is an office with built in desk, shelves, etc. Media room is wired and ready for action. Upstairs game room could easily feature a pool table or be used as a sitting area or TV room. There are 4 AC zones, tankless hot water heater, built in vacuum and a speaker system with controls.The attic has a stairway and lots of decking for storage. Excellent location-easy drive to downtown,the energy corridor,the Galleria, Memorial City Mall and many dinning & shopping opportunities. Renaudin Builders combines the perfect balance of traditional and contemporary features into this beautiful 4,082 square foot home zoned to Memorial High School. Highlighted by a downstairs Master Bedroom, spacious Kitchen and Living room, playroom and three bedrooms and bathrooms upstairs, in addition to a large backyard with space for a pool. This home is perfect with plenty of room for entertaining guests. Completion Date: 3rd Quarter of 2018. 1.3 acres ready for development! Don't miss out on this opportunity! Lovingly referred to as "The Farm" for over 30 years, this piece of country in the city is a dream come true. 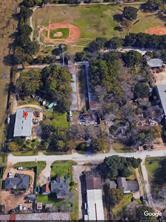 Land boasts 2.5 acres located minutes away from Memorial City, Memorial Hermann, and City Centre. The land has many build site opportunities for the home of your dreams or the opportunity to improve current home on property. In-ground pool, and a back yard guarded by trees and privacy can be found here. This neighborhood is seeing lots of new construction of sprawling grand estates and the property has never flooded. You can have horses in this neighborhood as well! Book your appointment today and come enjoy a sunset at "The Farm". Beautiful brick and stucco home with two courtyards, one housing a SUMMER KITCHEN, also has a ROOF TOP DECK, providing for loads of outdoor entertaining space. 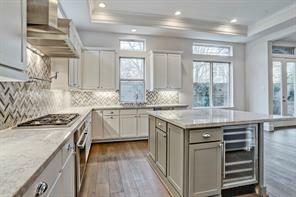 Upgraded kitchen with GAGGENAU APPLIANCES, a luxury German line, and stacked BROOKHAVEN CABINETS, overlook family room. WOOD FLOORS TROUGHOUT. NATURAL LIGHT is abundant. ELEVATOR installed. Designer paint and other finishes make this home truly unique. This traditional home by SRS Contracting boasts stylish and neutral finishes, hardwood floors, and a well executed floor plan with study and extra room. Chef's kitchen includes stainless steel appliances and granite countertops. Master retreat is on first floor with additional bedrooms up and all feature spacious closets. Property never flooded. Excellent Investment Opportunity. Looking for investors or developers. This property is perfect for a New Home Community such as Patio Homes, Townhomes, Apartment complex or Redevelopment of any kind. Unrestricted. Easy access to Beltway 8, I-10 and Highway 6. Minutes from City Center and Memorial Mall. Amazing High End build by Christian London Homes. Rare 5 Bed, 5 Full Bath, 2 Half bath home. The features on this house are endless. With amazing craftmanship thoughout, to thermador 48" Range, to Sub-zero refrigerator to the Built-in Coffee maker. The master Ceiling features a cathedral ceiling with fantastic master bath and custom closet. Contact for more information. 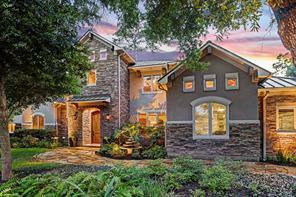 Beautiful Mediterranean home nestled in the Spring Branch community of Glenmore Forest. Built in 2007 by Cornerstone. This home has been immaculately maintained and with recent updates shows like new. Exterior painted in 2019. Custom iron entry doors invite you into this home that went through extensive updating in 2016. Kitchen was transformed into a chef's gourmet kitchen with Wolf cooktop & microwave, S/S Built-In KitchenAid refrigerator & S/S dishwasher, S/S farm sink W/large granite island. Water heaters installed 2017. Cedar Fence replaced 2018. Turf installed in backyard 2017. Saltwater pool/Spa added 2010. Exterior landscaping lighting 2017. This home boasts many more upgrades and is a must see! Zoned to Valley Oaks Elementary and Memorial High School. Check with school district for Spring Branch Middle transfer. Open Sun 3/31 from 1-4! Welcome to Home Sweet Home! 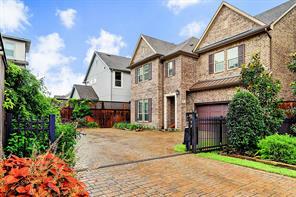 Recently updated luxury residence is a great value for its zoning to the highly sought-after Spring Branch ISD Hunter's Creek Elem and Memorial High located in Brykerwoods subdivision. 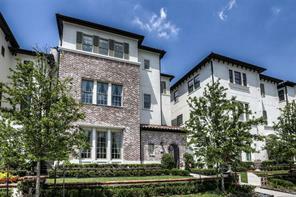 Centrally located with easy commute to downtown, the Med Center, the Galleria, Memorial City, and the Energy Corridor. This elegant 5 bedroom 4.5 bath, light & bright custom home has it all with an abundance of windows, open concept living for exceptional entertaining & gatherings, chef's kitchen with oversized island, 2 stair cases with easy access to upstairs from kitchen area & front entry, mud room, a show stopper master closet, open concept upstairs, media room with granite counter & wet bar, and also has room to put a backyard pool if desired. 7618 Edgeway is surrounded by a number of restaurants, cafes and shops, is a short distance from Memorial Park, has never flooded and ready for move in! Be sure to view 3D Matterport. On Point Custom Homes presents this thoughtfully designed take on the Modern Farmhouse. The open concept plan offers a Chef's dream kitchen featuring honed black granite countertops with butcher block accent on center kitchen island, custom built cabinets with floating white oak shelving accents & Thermador appliance package. The kitchen is open the spacious living area with fireplace and looks out to the covered veranda thru break away glass sliders. The living level also features a formal dining room and study. The luxurious Master Suite offers hardwood floors, large walk-in closet & spa-like master bath featuring gorgeous tile and lighting selections, double vanity and freestanding tub. The home also features a 2nd floor gameroom. This home sits on a large lot with room to accommodate a pool. 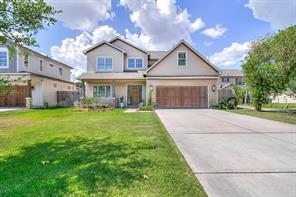 Fantastic Neighborhood zoned to Valley Oaks Elementary and Memorial High School. Also, middle school students may attend Spring Branch Middle per Spring Branch ISD. 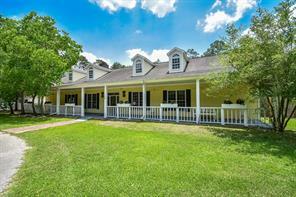 3 ACRE HORSE PROPERTY in TOWN! If you are looking for a touch of country living in the middle of town this is it!!! It is close to the Energy Corridor, the Memorial Area Medical Complex and City Center. Custom built home featuring a GREAT ROOM measuring 27' x 22' is the centerpiece of the house. It includes a vaulted ceiling with rustic timber trusses and hardwood flooring. Spacious kitchen includes an oversized brick prep island and a huge 6 ft x 4 ft cooking brick fireplace with gas. The accent timbers in ceiling are from a Kentucky log cabin originally built in 1690. The 50 ft x 50 ft barn has 3 spacious (16 ft x 19 ft) stalls. There are 2 turn out paddocks for the horses and a separate yard for the dogs. The 50 ft x 50 ft garage has ample space for 4+ cars. a large workshop, several storage closets, ½ bath with a utility sink and an unfinished apartment space above garage. The lot includes a 50 amp RV electrical hookup and an RV dump station. No FLOODING in any of the structures. This extraordinary home from master home builder Steve Gulledge, renowned architect John Sullivan, and The Luxe Designer, Lisa Roberts effortlessly blends open-concept contemporary design with soft touches to create an exquisite residence! Offering more living space and features than anything in the neighborhood, the home boasts soaring ceilings, designer fixtures and finishes, black steel windows, wide-plank hardwoods, and covered backyard living complete with outdoor kitchen! The entire home features Low-E windows, spray foam insulation, high efficiency HVAC, and Energy Star high-end appliances! Masterfully designed, this spectacular also home enjoys not only 5 bedrooms, but a downstairs office that could double as a 6th bedroom, an oversized game room, and a dedicated media room! 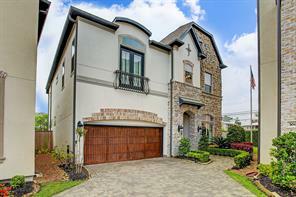 A quick drive to CityCentre, Town & Country, Memorial City Mall, and zoned to the best schools in Houston, this one will not last! LOCATION! LOCATION! LOCATION! ***Unrestricted*** Unique opportunity to purchase 1.25 AC in Spring Branch ISD. Ideal for a new home, or replat for multiple single family homes or other development. 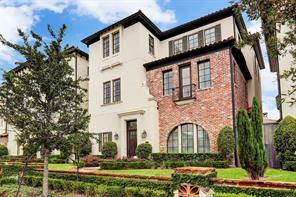 Next to Sherwood Elementary, close to 1-10, Beltway 8 and Town & Country and Memorial City Shopping Mall. Also, conveniently located for Katy area and Malls. Existing house currently being used as office; leased till 9/19. Please don't disturb the tenants. .Sold "AS-IS and in its present condition." Lot Value Only. Built by LEAM Design Build! 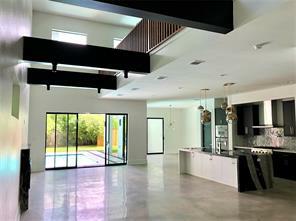 This unique, contemporary, modern home is full of stunning architectural details, design touches and natural light. This home is under construction and expected to complete June/July. It has 4 bedrooms (2 masters, 1 down), 4/2 baths, (open kitchen, large living with 16 ft sloped ceilings, formal dinning, study, media room, game room, flex room, spacious laundry with chute from master closet, and plenty of storage. The outdoor entertaining spaces extend seamlessly from the indoor social areas. The backyard has enough space for a pool. High-end features include Thermador appliances, wine cooler, hard-wired speaker system, custom cabinets, white oak built-ins, gas fireplace, hardwood floors, designer tile, LED lighting, energy efficient A/C, spray foam insulation and water efficient fixtures. 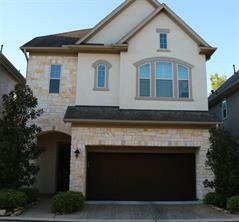 Located in booming Spring Branch, walking distance to Moritz park. Zoned to Valley Oaks Elem & Memorial HS; SB Middle transfer available per SBISD guidelines. 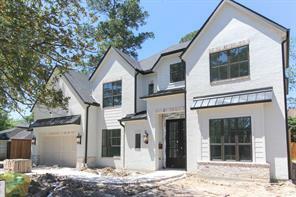 This beautiful new construction home by Park Road Builders features a full brick exterior with stone & stucco accents. Includes 4 Bedrooms, 3.5 Baths, a Covered Patio & a POOL & SPA W/OUTDOOR KITCHEN. First floor Master Bedroom, Study & Wine Grotto and a second floor Gameroom & Media Room. 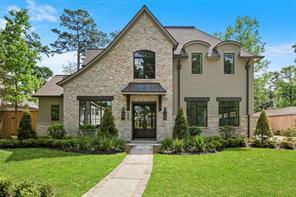 This home features high-end finishes & details, including crown molding, recessed lighting, high ceilings, natural stone counter tops, custom-site built cabinetry & hardwood flooring. Home offers JELD-WEN windows, high-end interior & exterior lighting, speaker pre-wire (Dining, Kitchen, Study, Master Bedroom & Patio) and a designer color scheme throughout. Spacious kitchen features a large island and a high-end Thermador appliance package including: a 36" 6-Burner Range, 36" Refrigerator, 24" Dishwasher, a 24" built-in Microwave and more! The home features a full sprinkler system, a professional landscape package, a covered patio with an outdoor kitchen, a swimming pool, a spa and so much more! This traditional home by SRS Contracting boasts stylish and neutral finishes, hardwood floors, and a well executed floor plan with study and extra room. Chef's kitchen includes stainless steel appliances and quartzite countertops. Master retreat is on first floor with additional bedrooms up and all feature spacious closets. 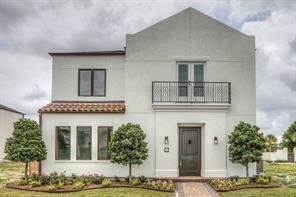 Love how you live in this fabulous new construction by Advant Homes. Stucco and stone exterior with open floor plan for today's lifestyles. Now move in ready with grand entry, kitchen open to den. Large eat in island! So many custom features and hardwoods throughout! Energy efficient with spray foam insulation, high end appliances. All bedrooms up with gameroom and media room. Porte cochere passes through to two car detached garage with quarters. Imagine lazy days and evenings on the covered back porch with summer kitchen. Room for pool - pool bath already in place. Fabulous central city location with excellent access to Energy Corridor, Memorial City, Galleria OR Downtown. Exemplary SBISD schools! 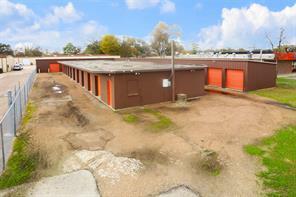 Raw asset perfect for any type of build in the heart of the Spring Branch. Ideal any builder or client looking for a special lot for their custom home or development. Exceptional, Italianate home in Ravenna ! 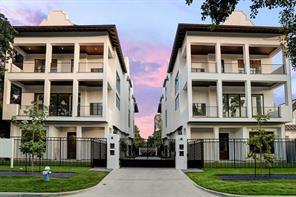 Ravenna is an exclusive, gated enclave of residences conveniently located next to the prestigious Awty International School and minutes from Downtown, the Galleria and Memorial Park! This home offers highly desired first floor living and dining areas enhanced by soaring ceilings and abundant natural light! Exquisite interior finishes consist of; 8" White Oak wood floors throughout, custom Brookhaven Cabinetry in kitchen/dining/baths, Carrara Marble countertops, Miele SS culinary suite of appliances- Built-in 48" Refrigerator/Freezer, Glass front- Tall Wine Cooler, Coffee/Espresso Maker, Convection/Microwave Ovens, Steam Oven, Warming drawer and 5 burner gas cooktop. Master suite has boutique hotel inspired details - Air-jet tub,(2)person shower w/dual spray and rain head, his & her closets. Breathtaking sunset views can be enjoyed from the covered veranda off Gameroom- 3rd floor has 4th bedroom&bath w/mini office! Elevator! Zoned to Memorial! LOCATION, LOCATION, LOCATION Perfect lot for your business or new construction project of apartments or gated home community. 46,082 square foot, rectangle shape, flat lot with two concrete driveways with gated access. Currently the home of Ragsdill School and includes the front house and several out buildings. DO NOT WALK THE LOT WITHOUT APPOINTMENT! PRIVATE PROPERTY. There is no current lease, there is no rent role. 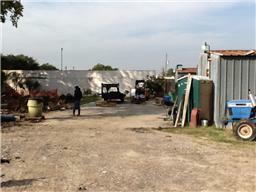 This listing is for the lot and existing buildings only. This is your opportunity to build the home of your dreams on approximately an acre of land in desirable Spring Branch. 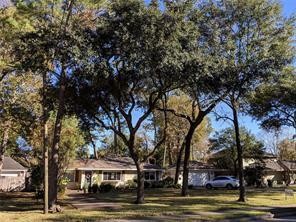 Prime corner lot with mature trees providing shade and privacy. This fabulous property is surrounded by newer luxury homes. The central location is superb with easy access to I-10, Memorial City; an easy commute to wherever you need to be in Houston. Zoned to desirable Spring Branch ISD schools, Valley Oaks Elementary, Spring Branch Middle, and Memorial High. 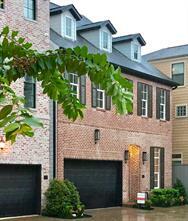 Campbell Place is a hidden gem of a neighborhood with large lots that cannot be subdivided. Experience country living in the city. Land like this is rarely available! House is livable. However, the value is in the land and the house is being sold AS-IS. Did not flood! Appointments are required and showings are accompanied. This is an occupied property. Please do not walk the lot without a scheduled appointment. Lot cannot be subdivided. Beautiful stucco and stone home on a large lot backing up to Glenmore Forest Park. Great architectural features. Alderwood front doors, wood and stone floors throughout first floor, granite countertops, stainless steel appliances, custom wine room. This great floor plan has a study, formal dining, wine room, breakfast, living and kitchen on the first floor. All bedrooms upstairs with game room overlooking the park. Entertaining backyard with pool, spa and even a slide into the pool! This home is zoned to great schools! Located on a large 7,605 sq. ft. lot zoned to Memorial High School, this new home by Quintessa Homes features 4 Bedrooms, 3.5 Baths, 20 ft ceilings, a first floor Master & Study and a 2nd floor Game Room & 2nd floor Media Room. High-end finishes include custom site built cabinetry with high-end counter tops, 10 inch baseboards throughout the first floor & 8 inch throughout the second. Kitchen features a 48'' Gas Range, a 42'' SubZero Fridge & a KitchenAid warming drawer. Seasonal storage closet neatly hidden behind a built-in bookshelf on the second floor. Home also offers a full sprinkler system, alarm pre-wire, home automation pre-wire and speaker pre-wire. Large backyard includes a deep covered back porch with an outdoor kitchen including a grill and sink, there’s plenty of room for a pool and so much more! Sophisticated recent construction home built by Lovett. First-floor living! This stunning home has a gated front courtyard with brick pavers. 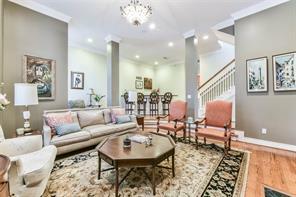 Inviting entry features hardwood floors, stairway with iron balusters and is open to the dining room and living room. Kitchen has soapstone countertops, SS appliances, white cabinetry and is open to the den. Spacious master suite, located on the second floor has a luxurious bathroom and two huge walk-in closets. Two secondary bedrooms with ensuite bathrooms are on the second floor, on is currently being used as a study. Gameroom with wet bar, bedroom, and covered balcony are located on the 3rd floor. The backyard and covered patio are great for relaxing and entertaining. 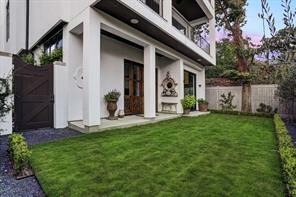 Artificial turf allows for ease of yard maintenance. Zoned to SBISD! A must see! 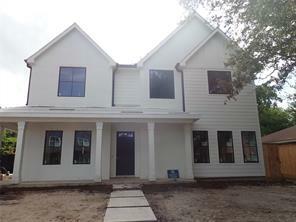 New Construction by Wood Custom Homes zoned to Memorial High School, 6430 Rolla has a deep welcoming front porch, 4-5 Bedroom's/ 4 Baths, 1st floor study and deep covered back porch. Large Family Room is open to the Chefs Kitchen with custom site built cabinetry, natural stone counters and a high end Thermador appliance package. Second floor features Game Room wired for surround sound and 4-5 bedroom's each with walk in closet. Camera pre-wire, alarm pre-wire, outlets neatly tucked away throughout the baseboards, a sprinkler system and room for pool! Builder offering *thousands* towards upgrades and changes! 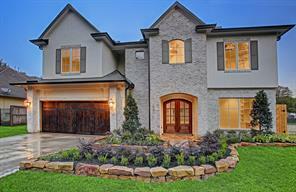 Beautiful new construction home located in Spring Branch offers 3 to 4 Bedrooms, 3.5 Bath – a 1st floor Study & Wine Cellar and a 2nd floor Game Room or could be used as a 4th bedroom with a large closet, Utility Room & Master Bedroom. 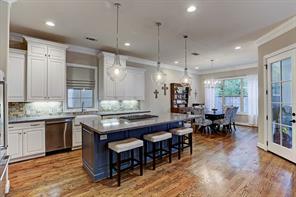 This home offers high-end finishes including high ceilings, recessed lighting, designer light fixtures, custom site built cabinetry, natural stone counter tops, ceiling fans and wood flooring throughout. Large Kitchen features an island with plenty of storage space and a high-end appliance package. Home also offers a deep front porch with metal roof detail, a deep covered patio and a spacious backyard with a pool! This home is just minutes away from your neighborhood HEB Memorial City Mall, City Center and the Galleria & 10 mins to Downtown! Calling all Investors, Builders, Developers. 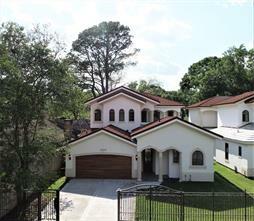 Located in one of the most desirable areas of Houston, This property includes rental income producing properties. 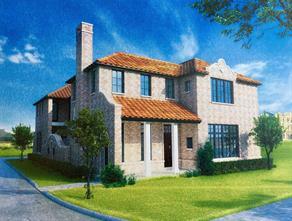 Builders, Developers, this is located in the city of Houston making this one desirable place for future development. Great frontage with extreme potential growth for the area. This area is quickly becoming the hottest place to live due to the School District location. Please call for any details or arrangement to view this property. 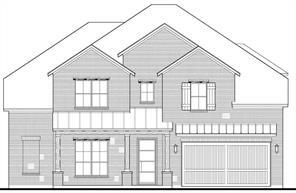 This beautiful new construction home by Quintessa Homes is zoned to Memorial HS, features 4 Bedrooms, 4.5 Baths and a 1st floor Study, 1st floor Master Bedroom & Secondary Bedroom & a 2nd floor Game Room, Media Room & Seasonal Storage Closet. High-end finish details throughout including high ceilings, crown molding, speaker pre-wire in the Dining Room, Kitchen, Master, Media Room & Covered Patio, high-end light fixtures and LED recessed lighting. Additional features include custom site built cabinetry, high-end counters, a designer color scheme and hardwood flooring. Kitchen will feature an island highlighted by designer pendant lighting that will offer plenty of storage space, a large pantry with built-ins and a high-end appliance package that includes a 48" Wolf Range and 42" Sub Zero. Outdoor kitchen, alarm pre-wire, sprinkler system, professional landscaping package and more! Construction slated to start mid-September. 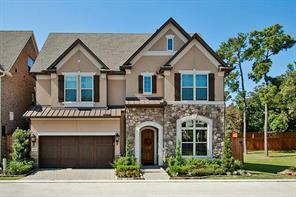 New construction David Weekley home in Gated Community. Upgrades include custom solid stone fireplace with custom wood mantel, AC jumper vents, GE Monogram stainless fridge, Electrolux washer & dryer, 1,000 lb. capacity hanging shelves in garage, holiday light outlets, pre-wired for security & sound, custom solid wood shutters & blinds throughout, glass enclosed showers in secondary baths, spacious attic storage, zoned sprinkler system w/rain gauge. Chefs kitchen w/floor to ceiling cabinets, breakfast bar, 6-burner gas cooktop, updraft vent & butler's pantry w/wine fridge & overhead cabinets. Master with a dedicated sitting area, two large walk-in closets, large soaker tub & oversized dual head walk in shower. Third floor includes a game room with full wet bar, additional storage closet and a 5th bedroom w/full bath. All shelving in home are by Spaceman and has a lifetime warranty. Beautiful back patio is plumbed for an outdoor kitchen & the yard has room for pool. 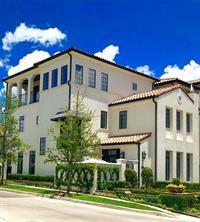 HZJ111-This two story stucco & stone home is located in a gated community in Coveted Spring Valley area. Wood floors throughout the first floor. The dramatic entry boasts 11 foot ceilings & a curved staircase w/formal dining room & study on either side. Past the wine room is the openly large family room that flows into the kitchen. The kitchen offers an island w/48" Thermador professional series stainless appliances, butler’s pantry & spacious island. Upstairs hosts the luxurious master suite w/spa tub & oversized closet. As well as the secondary bedrooms, hidden room & game room. Environments for Living Platinum level. Exemplary Spring Branch schools- Valley Oaks Elementary, Spring Branch Middle, & Memorial High School. Location, Location, Location! 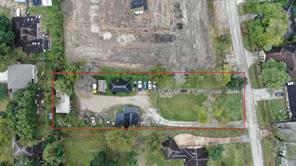 Incredible opportunity to build your dream home on an exceptional 30,472 square foot cul-de-sac lot in the heart of Bellewood! Selling for lot value only - property to be conveyed as is with no consideration to the structure. Never flooded. Estate. NO showings of the interior of home. 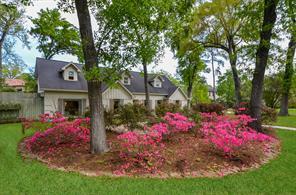 This beautiful property is surrounded by huge oak trees and extensive landscaping. A true gem near the Galleria/downtown and zoned to highly acclaimed Hunters Creek Elementary, Spring Branch Middle and Memorial High School! A rare find for this area! Spring Branch - This is a great property for builders with so much potential. It is unrestricted (per owner) and can be used for commercial and residential use. Fully fenced with two driveway gates. Close to I-10, 610, 290 & Beltway. Approximately 150' of frontage on Johanna and 293' of depth. Container is not included. Zoned to Memorial HS! This is the one. 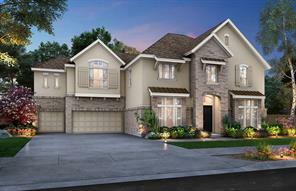 Gorgeous New Home by Coventry Homes in gated community: 2-story home w/open plan, 11 ft ceilings & 21 ft ceiling at foyer. Backyard can fit a plunge pool. 5 Beds, 5 full Baths, 2 half-baths, 3-car garage. Family Room w/stunning fireplace. Study, Formal Dining, Wine Room. Island Kitchen w/48'' Thermador professional stainless appliances. Luxurious Master Suite w/2 custom closets. Game Room, Snack Bar up. EFL Platinum. Valley Oaks, Spring Branch School. 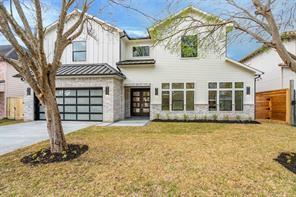 Gorgeous new construction home in the heart of Spring Branch is minutes from all that the city has to offer. 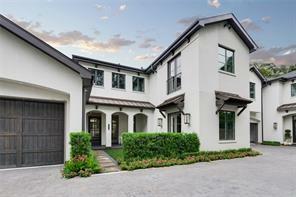 Built by Morgan Gianake Custom Homes and fully equipped to fit the needs of today. The impeccable home features soaring ceilings, an open living/kitchen/dining concept, stunning chef's kitchen and expansive gameroom prewired for surround sound. The stunning covered patio allows for ample outdoor living and features a fully fenced lush yard. In addition to the functional design, the home boasts floor to ceilings windows that allow for plenty of natural light and so much attention to detail. Throughout the home, the high end finishes are truly endless, featuring gleaming 4" white oak hardwoods, Quartz/Marble countertops, custom cabinetry and an expansive master retreat with spa bath and double closets making this the perfect place to call home for years to come. Three secondary bedrooms and a large gameroom complete the upstairs. 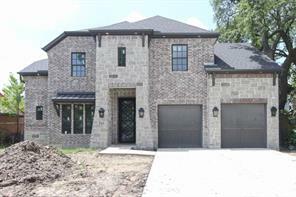 AMAZING CUSTOM HOME IN SPRING BRANCH!! OPEN FLOOR PLAN WITH 11 FT. CEILINGS AND TONS OF NATURAL LIGHT. 4 BEDROOMS, 4.5 BATHS, STUDY AND GAMEROOM WITH WET BAR. QUARTZ AND MARBLE COUNTER TOPS THROUGHOUT. BEAUTIFUL CABINETRY, CUSTOM LIGHTING, WOOD FLOORS THROUGH OUT EXCEPT SECONDARY BEDROOMS. 48" THERMADOR APPLIANCES. LUXURIOUS MASTER SUITE WITH YOUR DREAM CUSTOM CLOSET. QUALITY SHINES THROUGH: CABINETS TO CIELING, TILE TO CEILING, LARGER BASEBOARDS, 8' SOLID CORE DOORS, WOOD CLAD GARAGE DOOR, MUSEUM FINISH ON WALLS. TONS OF STORAGE - HUGE WALK IN ATTIC. COVERED PATIO AND NICE SIZE BACKYARD. SECURITY AND CAMERA SYSTEM INSTALLED. TONS OF NEW CONSTRUCTION IN THE AREA. CALL FOR A SHOWING TODAY. HOME WILL BE READY IN 2 TO 3 WEEKS. Located at the end of Knoll Street. Just south of Hammerly between Hollister and Campbell; north of Long Point. 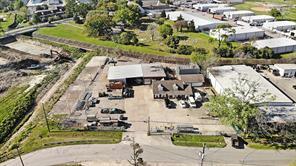 Additional 20,300 SF adjacent lot is also available for a total of 1.298 acres. 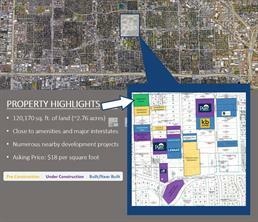 Lennar, Weekley, Pulte, KB Homes, Perry & Lovett all actively building nearby. Zoned to Memorial HS! Last opportunity remaining. To be built. Beautiful and Bright New Home built by Coventry Homes in a gated community: 2-story home w/open plan, 11 ft ceilings & high ceiling at foyer. Backyard can fit a plunge pool. 5 Beds, 5 full Baths, 1 half bath, 3-car garage. Family Room w/stunning fireplace. Study/Bedroom on first level, Formal Dining, Wine Room. Island Kitchen w/Thermador professional stainless appliances. Luxurious Master Suite w/ enormous custom closet. Game Room and hidden room up. EFL Platinum. Valley Oaks, Spring Branch School. Just reduced over $50,000! Over $50K updates. Elevator to all 4 floors! 3 car garage! 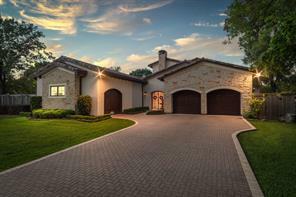 Stunning home in gated community of Ravenna. 4 bedrooms, 4 full en suite baths & 1 half bath. 1st floor boasts mud room, entry, guest room with full bath, walk-in closet. 2nd floor offers gourmet kitchen Miele stainless appliances, large island w seating. Formal dining. Living room w gas log fireplace, ceiling speakers, open to balcony. 3rd floor boasts master suite w spa-like bath, upgraded Jetta air tub. His/her sinks/walk-in closets, over-sized shower w seamless glass. All secondary bedrooms w walk-in closet, Hollywood bath to bedroom #4 w walk-in closet. Large patio located off media room for grilling or relaxing. Spring Branch ISD zoned to Spring Branch Middle & Memorial HS. Lush landscaping, 77' resort-style glistening pool w cabanas & private clubhouse, dog park. I-10 & 610 w minutes to Galleria/Uptown, River Oaks Center and downtown. No Harvey flooding per seller. This remarkable home guarantees high-end construction materials, finishes and appliances. 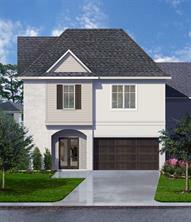 Minutes away from main Houston freeways (610, I-10, 290 and Beltway 8) and the Galleria area. 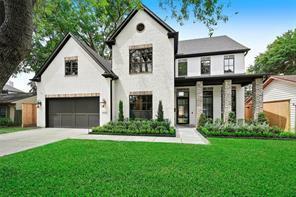 Stunning custom modern home with a traditional touch in the heart of Spring Branch; amazing craftsmanship with top quality materials. This home was built with the intention to maximize your quality of living. 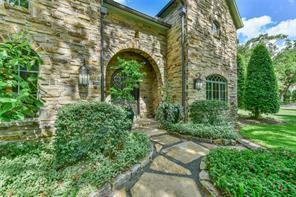 If you enjoy living in the castle of the neighborhood this home is built for you. All materials were hand selected making this truly a unique masterpiece. Elegant iron handrail and stair case from foyer with beautiful chandelier. Study has built in bookcases and richly appointed woodwork throughout home. Sizable balcony off of living room. Thermador gourmet chef’s kitchen with stainless steel appliances. Custom utility room with washer and dryer. First floor master suite with an over-sized closet and luxurious bath plus 2 additional bedrooms. Second floor includes 1 master suit, 1 bedroom and a couple of cute tiny rooms for your “’mini me”. Not to mention the location where surrounding areas are blooming. Do not wait a minute longer, schedule your private tour today! This remarkable home guarantees high-end construction materials, finishes and appliances. 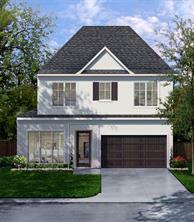 Minutes away from main Houston freeways (610, I-10, 290, Beltway 8) and the Galleria area. 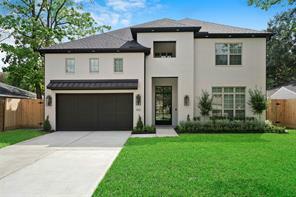 Stunning new construction by Southaven Homes in Spring Branch. Walk-in to the dining room with high ceilings, designer lighting, custom wine build-out with under counter refrigerator and a wine cellar for extra red wine storage. The Kitchen has Viking appliances, quartz counters, extra large island with an abundance of storage and open to the living room. Master is on the first floor with an oversized closet and connected to the laundry room for ease. The second floor includes 3 bedrooms, 2 bathrooms and a large game room with the media closet. The back patio is prewired and plumbed for your outdoor kitchen and the yard is large enough for a pool and still have green space. Wonderful Custom Built Home. The home has a grand entry with two story high ceilings. Hardwood floors, gorgeous lighting, sold core doors, high end finishes, stainless appliances, gameroom, and 5 large bedrooms. The open concept layout is wonderful for entertaining and the oversized backyard is perfect for play or if you want to add a pool. And if things are not perfect enough - it has a chicken coop - fresh eggs anyone. 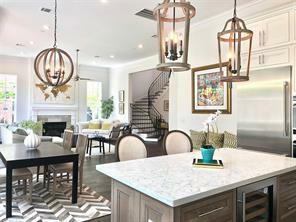 Located in a small gated community consisting of 28 homes in Monarch Oaks, this future home by Butler Brothers is zoned to Memorial HS & offers high-end finishes including quartz counter tops, designer Circa lighting, wood flooring throughout the 1st floor & casement windows. Chefs kitchen with soft-closing drawers, a Bosch appliances include a 36'' 6 Burner Cook top, a Bosch wall oven, SS dishwasher & Bosch microwave. Full gutter system, underground French drain system & is elevator capable. This house is so pristine, it feels like new construction! Zoned to Memorial High School and within walking distance of Awty International School. Move in ready with plantation shutters, new carpet, paint, and granite throughout! First floor living with elevator that provides easy access to all three floors. 3 bedrooms including the master on the 2nd floor make this a great set up for families with little ones. 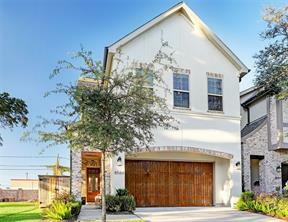 Perfectly situated just outside loop 610, with easy access to I 10. First floor living with a lovely patio and grilling area just outside French doors, and plenty of space including a huge media room plus a 4th bedroom and full bath on the 3rd floor, perfect for extended stay guests or college kids/older parents living at home. Beautiful community pool and amenities. 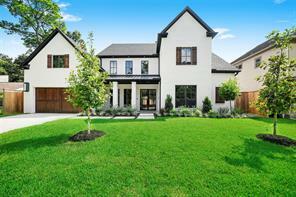 Stunning new construction, open-concept home in Spring Branch is an entertainer’s dream! This home features 4/5 Bedrooms, 3.5 baths, Covered Patio with Outdoor Kitchen, Mud Room, first floor Study and Master Suite, and second floor Media/Bonus Room and Guest Suite. This high-end, designer home offers 11’ ceilings, recessed lighting, beautiful light fixtures, quartz countertops, custom built-ins, and striking hardwood floors. Chef’s kitchen includes a large island with designer pendant lighting, custom vent hood, access to Butler’s Pantry/Bar with a wine-fridge and Thermador appliances, including a 48 inch gas range. The Master Suite features a spa-like bathroom and a large walk-in closet. Media Room features theater lighting and is projector ready. Pre-wired for surround sound and security system, including cameras. Includes sprinkler system, gutters, professional landscaping, spacious backyard, and more! 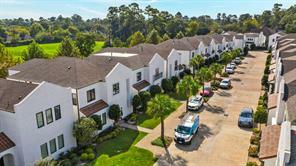 Excellent location, minutes from Downtown, Galleria, and Energy Corridor. Gorgeous free-standing home with custom finishes throughout located in Ravenna, a manned gated community developed by master developer and builder Lovett. Amazing location near the Galleria and adjacent to the beautiful grounds of the Awty International School. Impressive exterior with stucco and brick façade and tiled roof. Beautifully maintained lawn, welcoming courtyard, and street parking invite guests into this lovely first floor living home. Open floor plan with hardwoods, soaring ceilings, abundant natural light, rich stone and marble surfaces. Spacious island kitchen with upgraded appliances. Formal dining room off of the kitchen is perfect for entertaining. Second floor has an amazing master suite with gorgeous bath and two additional bedrooms both with an ensuite. Huge third floor entertaining area with kitchenette and custom built ins and an additional bedroom/bathroom. Upgraded patio with custom cover and remote. Private pool access. See docs for extensive upgrade list. Completely gated Modern Farm Home by award winning Corbella Inc. Designed to entertain with Kitchen open to Family room and 15’ folding doors extending the living space onto the large covered Veranda. ProSeries KitchenAid appliances and marble counters. 6” Hardwood floors throughout. LED recess lights. Speakers in Kitchen, Family & Veranda. Energy efficient home. 3891 sqft per builder. 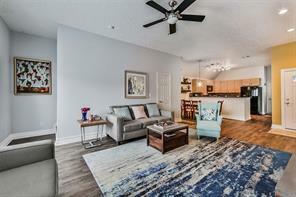 Plenty of room for pool and existing slab for future Pool House, Studio, Quarters or income producing apartment.Conveniently located near Memorial City Mall, Citycentre Plaza, Town & Country Shopping Center and a short drive to The Galleria & Uptown Shops. DID NOT FLOOD!!! 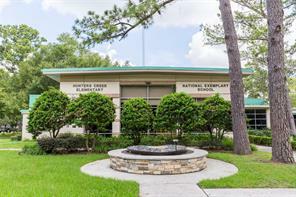 Zoned to HUNTERS CREEK ELEMENTARY SCHOOL. Also Spring Branch Middle and Memorial High School. Exclusive, gated community with easy access to I-10. Landscaped patio yard to let your dog out. 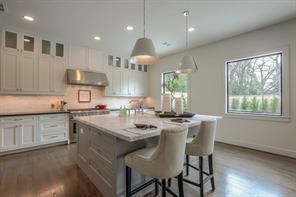 Stunning kitchen features custom stacked Shiloh cabinetry and Fisher Paykel appliances. Beautiful brick exteriors, each home unique (anti cookie-cutter). Relax in your Master Suite with luxurious Japanese bidet toilet. Hardwood floors throughout (NO CARPET). Elevator capable. CONSTRUCTION HAS NOT YET BEGUN!! Another beautiful home by Quintessa located on a large 10,400 sq.ft lot! Features include 4 Bedrooms, 3.5 Baths and a 3-car garage- a first floor Master Bedroom & a separate Guest Suite and a 2nd floor Game Room, Media Room & Seasonal Storage Closet. High-end finishes and details throughout including high ceilings, crown molding, custom-site built cabinetry, high-end counter tops, LED recessed lighting and wood flooring. Spacious kitchen will feature a large kitchen island, designer pendant lighting, plenty of storage space and a high-end appliance package. Home will also offer speaker pre-wire in the dining room, kitchen, master bedroom, media room & covered patio. Designer selected light fixtures and color scheme throughout, covered patio, full front & back sprinklers, alarm pre-wire, a professional landscape package and an immense backyard with room for a pool! 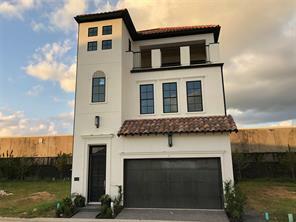 Located in a gated community consisting of just 28 homes, this new construction home offers high ceilings, natural stone counter tops, Circa lighting, wood flooring and casement windows throughout. A sizable Chefs kitchen feature high-end cabinetry, a large kitchen island and a high-end appliance package including: a 36" Burner Cook top, a Bosch wall oven, SS dishwasher & Bosch microwave. Will also features a covered patio with plenty of seating room, a full gutter system with run off piped to the French drain system and more! 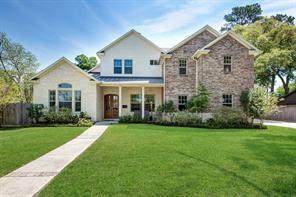 Beautiful AS NEW home zoned to Houston's most wanted public schools, Spring Branch and Memorial High School. Walking distance to Awty International School. Features high ceilings, hardwoods, formal dining with wine grotto, large island kitchen, Miele appliances, granite countertops and butlers pantry. The second floor boasts a spacious master suite with spa bath and two large walk in closets as well as two additional bedrooms with private baths. The fourth bedroom is located next to the large media/game room with a full bath. Additional parking in gated driveway. This home is nearing completion and features FIRST FLOOR LIVING areas with 12' CEILINGS, and offers master plus one bedroom on second floor, and a third bedroom and game room on third floor. GAME ROOM is plumbed for future WET BAR and opens up to fabulous 17x18 ROOF TOP DECK with views of Williams Tower. Grill in your own FENCED-IN BACK YARD, measuring 31x15. Zoned to MEMORIAL HS. Designed and executed to perfection, 1614 Johanna offers an unrivaled level of sophistication: Enter through the gated driveway and all glass garage door onto a first floor living with 2 story ceilings overlooking the serene private pool. Stained concrete floors and a massive island kitchen enrobed in Calacatta Quartz featuring Thermador built-in appliances and custom built cabinetry. The astonishing & massive owner's suite features a huge custom-built closet, a separate seating area and a remarkable hotel-like bathroom. 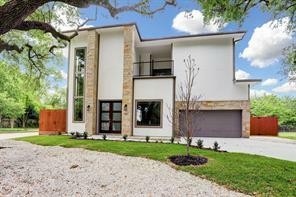 This grand 3,526 sqft stylish and modern villa is fantastically located in the heart of Spring Branch. Every square foot of this quintessential residence has been fully customized to pristine perfection and is the textbook example of a luxury new construction. Unbeatable layout and exquisitely designed! First-floor living is abundantly bright and perfect for entertaining with open concept living room and kitchen with massive centerpiece island. 1+ acre tract with 255 frontage on Blalock and access to Clay Rd. Located against Jack In The Box at high car count before intersection of Blalock and Clay. Cross easement through Jack In The Box and signage easement on Clay. Clear and high, ready for development. Great tract to cash in on established lunch traffic flow! Excellent for non-hamburger/taco fast food, retail center, commercial, industrial or gated residential. Sewer and storm on tract. 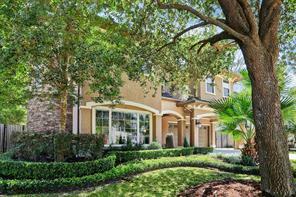 Gorgeous free-standing home with custom finishes located in the gated community Ravenna. Great floor plan with hardwood floors, elevator to all 3 floors and plantation shutters throughout the entire home. First floor boasts gourmet kitchen, dining room, den with wall of built-ins, fireplace, surround sound and French doors opening to the large backyard with room for a pool. Second floor has a large en suite bedroom, study, master bedroom suite with marble master bathroom, his and her vanities and over-sized shower with seamless glass. Third floor has guest en suite bedroom, game room and large rooftop patio overlooking incredible downtown skyline. Ravenna has a 77' resort-style pool with cabanas and private clubhouse, dog park and zoned to Spring Branch Middle School and Memorial High School. 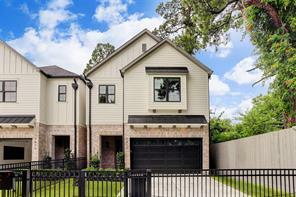 New Gated Hamlet on Bingle between I10 and Long Point. This home is show ready and shows magnificently! Students attend highly acclaimed Memorial High School, Spring Branch Middle and Valley Oaks Elementary. . Thermador Appliance package Carrera counter tops hard wood floors. This home is nestled in a brand new community that just sold out. Home has 4-5 bedrooms depending on your needs and 4.5 bathrooms. Call listing agent to see the home 24 hour notice required. 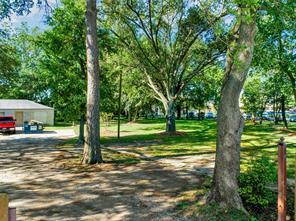 Corner lot on Park with green space all around! 4 story model home floor plan featuring ELEVATOR, 3 bedrooms, 3.5 baths, and game room. Gorgeous spiral staircase. Balcony off every level with large covered deck on 4th floor. Sand and finish wood floors through out main living area. Large master bedroom with coffered ceiling. Master bath is gorgeous with barrel arch ceiling, breakfast bar, large walk-in shower, tons of cabinets and countertop space, oversized soaking tub, and huge closet with pass thru to utility room. Game room has wet bar and Grill on 4th floor. Somerset Green is a guard gated community with a lake and canals with tree lined pathways throughout. Community offers pool and pavilion for entertaining. Coventry offers 2 / 10 year warranty and all homes are EFL Certified with Energy guarantee. Home will be ready in September. 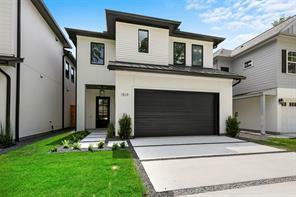 This beautiful Contemporary home by Avan Construction offers an incredible floor plan with 4 Bedrooms, 3.5 Baths, a large covered patio and room for a pool! The second floor Master bedroom features it's own private patio with an incredible Master Bath/Master Closet. Home will include designer features throughout with high-end finishes, soaring ceilings, extensive recessed lighting, natural stone counters, custom site built cabinetry and hardwood flooring throughout. The spacious kitchen will feature a large island with a breakfast bar & designer pendant lighting, an abundance of storage space and under cabinet lighting. Kitchen will also offer top of the line appliances! Home also includes home automation pre-wire, speaker pre-wire, a full sprinkler system, a TPO membrane roof and much more! 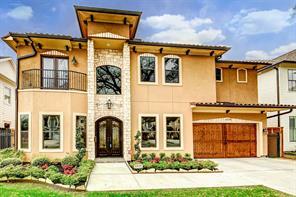 Come feast your eyes on this one-of-a-kind, luxurious, custom home in desirable Spring Branch. 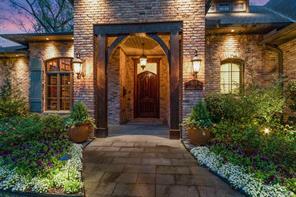 Circular driveway leads to stunning double-door entry. Retreat in style with home featuring both Formal-Living and Dining, Den, total of 5 Bedrooms with your choice of master suites, 1 master up and 1 master down, Game room, and Media room. 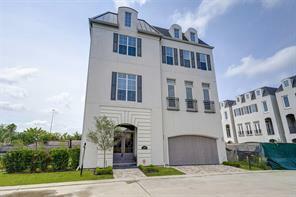 Breath taking sweeping staircase in this grand 2-story complete with private balconies and walk-in gun safe. This 6,143 square foot house, built in 2011, sits on a 10,454 square foot lot. There is so much detail you really have to see it for yourself. Everything in the home stays. Chandeliers, surround sound, movie projector, all appliances, and much, much more. 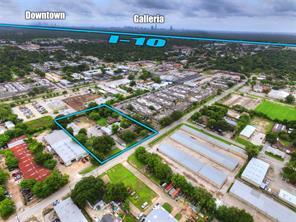 Easy access to I-10, Downtown, Galleria, and Energy Corridor. Pictures cannot describe the UNIQUE craftsmanship that went into this home. Home open daily. Call/text agent to schedule your tour today! 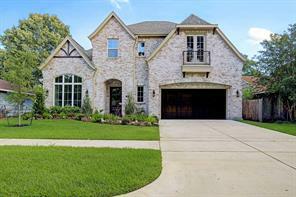 AMAZING CUSTOM HOME IN SPRING BRANCH!! OPEN FLOOR PLAN WITH 11 FT. CEILINGS AND TONS OF NATURAL LIGHT. 4 BEDROOMS, 4.5 BATHS, STUDY AND GAMEROOM WITH WET BAR. QUARTZ AND MARBLE COUNTER TOPS THROUGHOUT. BEAUTIFUL CABINETRY, CUSTOM LIGHTING, WOOD FLOORS THROUGH OUT EXCEPT SECONDARY BEDROOMS. 48" THERMADOR APPLIANCES. LUXURIOUS MASTER SUITE WITH YOUR DREAM CUSTOM CLOSET. QUALITY SHINES THROUGH: CABINETS TO CEILING, TILE TO CEILING, LARGER BASEBOARDS, 8' SOLID CORE DOORS, WOOD CLAD GARAGE DOOR, MUSEUM FINISH ON WALLS. TONS OF STORAGE - HUGE WALK IN ATTIC. COVERED PATIO AND NICE SIZE BACKYARD. SECURITY AND CAMERA SYSTEM INSTALLED. TONS OF NEW CONSTRUCTION IN THE AREA. CALL FOR A SHOWING TODAY. HOME IS READY FOR MOVE IN!! Located on a large 7,488sq. 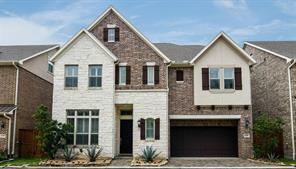 ft. lot zoned to Spring Branch ISD, this new home by Quintessa Homes features 4 Bedrooms, 3.5 Baths, 1st floor Master & Study & 2nd floor Game Room, 2nd floor Media & Seasonal storage Room. High-end finishes include custom site built cabinetry w/high-end counter tops, wood flooring, & 8 inch baseboards throughout 1st floor. The high-end Kitchen appliance package includes a 42" Sub-Zero refrigerator, a 48" Wolf 8-Burner range w/double ovens, a Bosch Dishwasher and a Kitchenaid warming drawer!. Also offers full sprinkler system & sod in front yard only, alarm pre-wire, home automation pre-wire & speaker pre-wire in Dining, Master, Kitchen, & Back Porch as well as French Drains w/Gutters Tied into the Drains for Efficient Back & Side Yard Drainage (where applicable). The completed backyard will feature a 7 ft. privacy fence with a rot board & an extended covered back patio with OPTIONAL outdoor kitchen to include a grill, sink, & counter top. 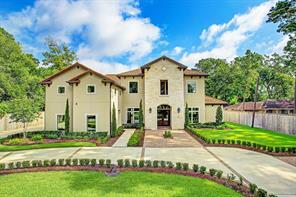 Fabulous five bedroom four bathroom one of a kind custom home by J. Colomer Homes. This beautiful home gracefully combines the classic and the contemporary in its design. Its airy light filled interiors draw you in with wide-open entertaining spaces that flow effortlessly from the inside to out. It's the quintessential place to entertain in style. The Butlers Pantry is the perfect staging areas for serving meals, as well as storage space is conveniently located between the Dining Room and Kitchen. The dramatic Living room boasts a 20-foot cathedral ceiling and double sided fireplace. Master bedroom downstairs with showstopping Master Bath has His and Hers closets, pocket doors and pass through Laundry. All Secondary Bedrooms are spacious and have large walk in closets. Huge outdoor covered patio is connected to the three car garage via an elegant walkway. Automatic driveway gate will be installed. 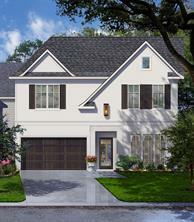 Riverway Builders former model home in gated Spring Valley Cove reviles new construction. Zoned to acclaimed Spring Branch ISD schools including Memorial High School. The home is situated on one of the largest corner lots in the community and features builder upgrades throughout. The open concept gourmet kitchen has professional-grade Thermador appliances, dual dishwashers and wine refrigerator. Formal dining room and designated study on first floor. Master suite with dual vanities and large walk-in closet, two additional bedrooms with en suite baths included on second floor. Third floor flex room with full bath and dry bar with mini refrigerator. A covered back patio and yard can be enjoyed year-round. 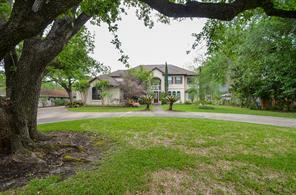 Situated in a gated neighborhood in Spring Branch, this 5 bedroom home sits on a premium corner lot. The bright and open floor plan features additional upgrades including 11 foot ceilings, hardwood floors, custom plantation shutters and wine refrigerator. A rarity, the HOA fees include front and back yard maintenance, water bill, trash, recycling and features a community pool. 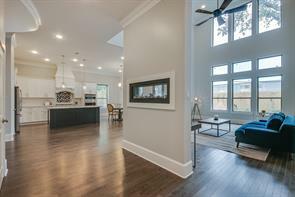 The energy efficient home was built by David Weekley Homes and is surrounded by a number of restaurants, and is zoned to Memorial High School. DID NOT FLOOD. Highly acclaimed interior designer Roseanette Navarro’s personal home is on the market! Each room is filled with touches of class, style and sophistication. Ravenna offers a lock and leave environment. 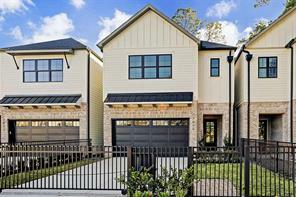 In the heart of Spring Branch it is centrally located to downtown, the Galleria and the Energy Corridor. The home offers first floor living, high ceilings, lots of light, hardwoods, Miele appliances, large walk in closets, fenced in backyard and a 3rd floor terrace with downtown views. 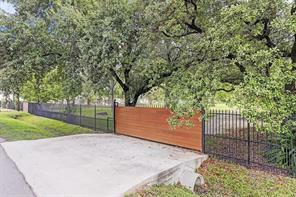 Gated community in spring branch. This home is an interior residence with east facing back yard and patio. High ceilings and high end finishes. Barely lived in and ready for a new owner. Zoned to spring branch school district and some of the most sough after schools in the city. See attached floor plans that shows first floor living, dining and kitchen. 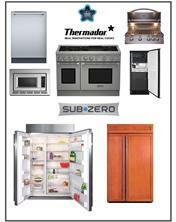 Thermador package with build in refrigerator and large island kitchen. 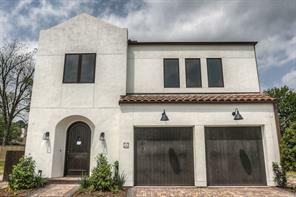 Impeccable, unique finishes with the tile work, counters, back splash and flooring. Covered back Patio overlooks courtyard-like yard space. Spacious Master Suite. Master Closet is amazing (more than 15 feet long!). Large 3rd floor Game Room and Full Bath offer flex use. One of the best floor plans in the community - in my opinion! 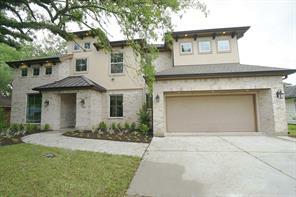 Amazing new construction in Spring Branch with the master suite on the first floor. This house is stunning with a white painted brick exterior, 9 '- 11' ceilings, wood floors, beautiful windows, quartz counters, wood beams, custom trim and cabinets, neutral colors, a game room, large backyard and outdoor kitchen. This house has it all! Enter the home a notice the gleaming wood floors, the large dining room on the right and a private study on the left. Continue through the entry to the open living area, breakfast room and dreamy kitchen with stainless, professional grade appliances, quartz counters and gorgeous tile accents. The first floor master suite and living/kitchen areas overlook the wonderful backyard and outdoor kitchen. This house is the entertainer's dream! Follow the stairs, with a wrought iron railing, to the second floor and find a terrific game room, three additional bedrooms and a great amount of storage. This Home has been remodeled. High Ceilings in the main living area. Very open with large windows across the back of the house. Master down, plus Formal Living and Dining, Den (which could also be the fourth bedroom). Huge beautiful kitchen with built-in appliances. Granite Counter Tops. Guest quarters with a full bath and kitchen overlooking the pool area. Fireplace in Formal living area. Fabulous lighting throughout the entire home. Balcony off one of the upstairs bedrooms. Travertine/Limestone flooring throughout main living area. This home is a must see! 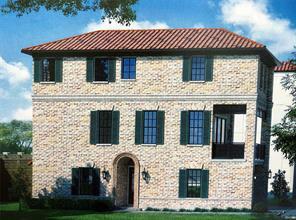 Great Townhome Development Opportunity in the Spring Branch submarket. The property has been replatted for 8 townhomes and the sale comes with the plans included. All that is necessary to begin construction of the development is to obtain permits. The property is zoned to desirable Memorial HS. 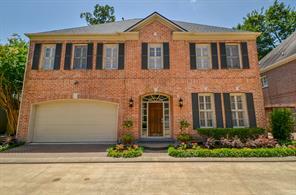 Charming traditional in gated Grace Cove in Spring Branch. Inviting front porch welcomes you. The large family room with stone fireplace and dry bar opens to the kitchen and dining area with access to the backyard is ideal for entertaining. High ceilings and hardwood floors throughout the first floor. Gourmet island kitchen features marble countertops, custom cabinets and top-of-the-line stainless steal appliances. A designated study that’s accessed through sliding doors is also located on the first floor. The gracious master suite with marble bath and walk-in closet is located on the second floor along with two additional bedrooms with en suite baths. A third floor flex room with full bath can function as a bedroom or game room. A covered back patio can be enjoyed year-round. 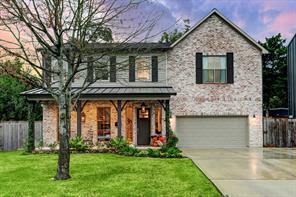 Stunning Spring Branch home featuring 4 spacious bedrooms, 4 full baths, heated pool, bonus room, study, mud room and amazing attention to detail throughout! Gorgeous fixtures, a Bertazzoni range & beautiful hardwood floors. Thoughtfully designed floor plan with extensive master retreat and additional bed & full bath down. Upstairs features 2 additional bedrooms and a great flex space that ideal for a game room. Backyard is wonderful for entertaining with large covered back patio, outdoor kitchen, ceiling fans and lovely heated pool with water feature. A must see! HIGHLY MOTIVATED SELLER. 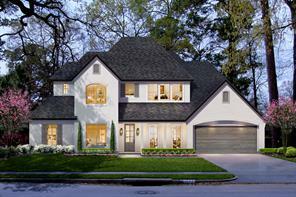 This Gorgeous Traditional luxury meets City Living in a Growing Community. Custom built home with countless features. 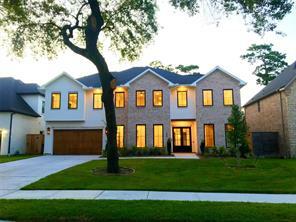 The home is prestigious with high ceilings, beautiful red oak hardwood floors, 8' tall doors. Gourmet Kitchen with Quartz Counter tops, soft close cabinets and High-End Viking appliances. Every Chef's dream!! You’ll find tray ceilings, custom lighting, Grand vaulted ceiling, 8" baseboards, brushed nickel, dry bar, butlers pantry and wine cellar just to mention some of the upgrades done. The Master Bathroom is perfectly designed with double sinks and a makeup vanity and a dream walk-in closet giving it a Hollywood feeling. 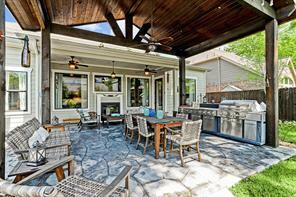 Large prewired Patio is spacious enough to build an outdoor kitchen. The home was designed to be very energy efficient for low electrical bills. Definitely the house that you and your family will enjoy for years to come. ASK FOR THE FEATURE SHEET. You will be blown away by the custom selections in this home. 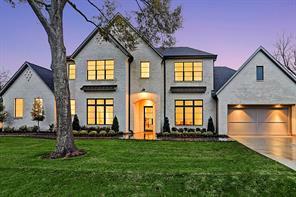 Beautiful brick & limestone recent construction home seamlessly blends the BEST of modern design w traditional features you expect to find in a custom built home. Situated on a 14,000 sqft lot (HCAD), this masterpiece offers 1st flr Master w spa-like bath, dual marble countertops, clawfoot tub, & huge custom fitted closet, study/2nd bdrm dn, Open concept Family Room w Limestone fireplace & wall of French doors, gourmet island kitchen w breakfast bar seating, spacious bkfst rm, + “Keeping Room” perfectly utilized as 2nd gmrm/play rm. 2nd floor offers flexible floorplan w huge studio/gmrm (22x22) w pine floor, 14’ vaulted ceiling, + Media Room & 3 addtl bedrooms. Expansive backyard w covered porch, built-in summer kitchen, gorgeous oak trees, & room for dream pool! Addtl amenities include oversized garage w cedar doors, vaulted ceilings, Pella French doors, Jeld-Wen windows, partial Galvalume metal roof, spray foam insulation, 3rd floor attic built w option of addtl living space & more. Come home to this fabulous home in a gated community. Beautiful garden and outdoor areas, as well as spacious motor court. 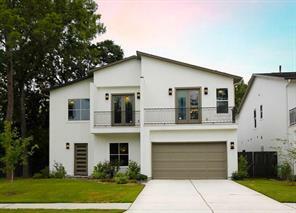 5 bedrooms 4 ½ baths, high ceilings, gleaming wood floors, granite counters, stainless appliances and fireplace. 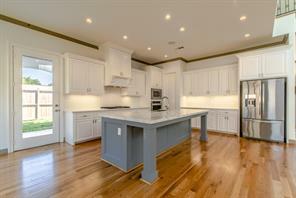 Spacious island kitchen flowing to living and dining areas ideal for large gatherings. Gorgeous master with additional sitting area. Third floor get-a-way/gameroom with private guest suite. Elevator access to all 3 floors. Highly sought after SBISD schools! 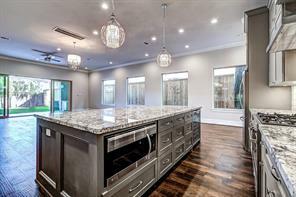 Located in a gated community consisting of just 28 homes, this new home offers high-end finishes including quartz counters, designer lighting, high ceilings, wood flooring floor and casement windows. Chefs kitchen with soft-closing drawers, high-end Bosch appliances including a 36'' 6 Burner Cook top, a Bosch wall oven, SS dishwasher & Bosch microwave. Full gutter system & underground French drain. Zoned to Memorial HS! Builder is giving away **thousands** in free upgrades!!! Contact listing agent for more details!!! 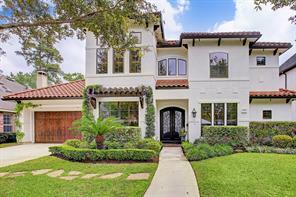 Uber-cool and ultra-sophisticated Spring Branch home in the highly desirable gated community of Ravenna within close proximity of Awty School and minutes from the Galleria, Energy Corridor and Downtown. All Bedrooms have en suite baths. 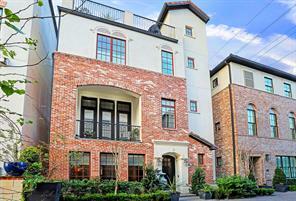 Light, bright and open with soaring ceilings, fine finishes and upgraded Kitchen package, three story Elevator, three car garage, gorgeous hardwood floors and lovely balcony overlooking a lushly landscaped courtyard. The community boasts a resort-style Pool, Clubhouse and a large Dog Park with plenty of room for Rover! 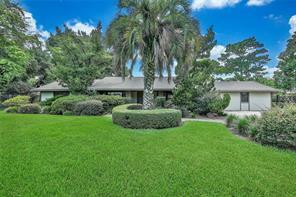 Beautiful Interior Corner Lot in Brykerwoods Estates. Formals plus Den with Fireplace and Study. Separate Breakfast Area. Mud Room with lots of storage. Large Master Suite on First Floor including Zen Garden and sitting area inside and out. Absolutely Gorgeous! Large Cedar closet in Master. Extra room upstairs can be used for a media room. Work shop in the garage with A/C. Extra Parking. Tankless Water Heater. Lots of detail in this home, it's a Must See! 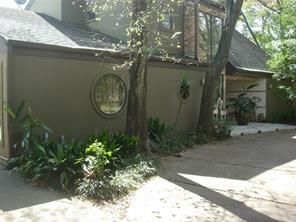 Close in to Downtown, Galleria and Med Centers. Excellent Schools, Shopping, Restaurants. School Bus Stops right in front of the house. Private Patrol throughout the neighborhood. No drive through traffic. Very Quiet and Private. Walking, Bike Riding! Pond and fountain in back yard. Fruit trees. Large back yard. Patio off the Den. Study downstairs with large window looking into the backyard and French doors leading to the Patio. Very Open Lots of Windows. Wet Bar off master with Frig. Priced Under Appraisal District Value. Beautiful curb appeal & beautiful neighbors! 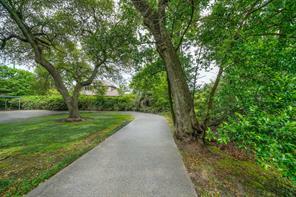 Mature Live Oak & fresh landscaping welcome you home. French doors lead to private study. Light & bright formal dining. Open concept kitchen, breakfast, den. All flooring replaced entire home w/ the exception of some baths. 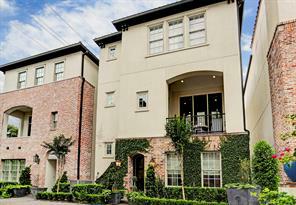 Downstairs features wood grain tile floors, 10 foot ceilings, crown molding. Master bedroom down. Master bath updated w/ garden tub & glass shower. Floor plan has so much versatility. Secondary bedroom up is larger than the master w/attached hobby room & walk in closet. The large media rm has a closet & could easily be a fifth bedroom, also larger than master. Game rm off the media. Fresh interior & exterior paint. Sprinkler system. Alarm. Low-E windows. Both HVAC systems replaced (2017). Covered back patio w/ built in grill area. Location, location! New & recent construction surrounding. Zoned to Valley Oaks Elementary & Memorial High School. This block of Glourie has option to transfer to Spring Branch Middle School. Ever-changing array of architecture and style come together in this former model home by David Weekley. Magazine quality elements embellish the exterior of this stunning character-laden home where millwork crowning the windows is an indication of the attention to detail that was used in it superior construction. Zoned to Spring Branch ISD and Spring Branch Middle with transfer letter. Great attention was given to fine detail represented by rich millwork, uniformity of arches, and 2 fireplaces. A livable transitioning flow accompanies the home showcased by an impressive oak tread staircase and bright light that sweeps the downstairs. Resplendent in upgrades, the image of quality is articulated in this show stopper home. Located in a gated community consisting of just 28 homes, this new construction home will offer high ceilings, natural stone counter tops, Circa lighting, wood flooring and casement windows throughout. A sizable Chefs kitchen feature high-end cabinetry, a large kitchen island and a high-end appliance package including: a 36" Burner Cook top, a Bosch wall oven, SS dishwasher & Bosch microwave. Will also features a covered patio with plenty of seating room, a full gutter system with run off piped to the French drain system and more! Builder is giving away **thousands** in free upgrades!!! Contact listing agent for more details!!! Back in the market! Buyer s loan was not approved! 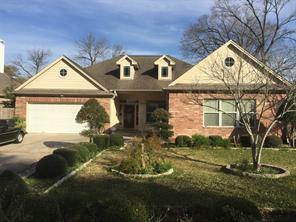 Gorgeous house situated in the great area of Spring Branch. Enjoy high ceiling and stone fireplace in the inviting living room perfect to accommodate large gathering. Sophisticated kitchen with stainless steal appliances, upgraded granite, and upgraded cabinets. Breakfast area with tons of natural lights and with great views to the cover patio and green yard. Elegant wood floors, iron staircase, crown molding and plantation shutters all around. Tasteful master bedroom with her and his closet, double sinks, separate shower and jacuzzi in master bathroom. A unique second suite with a full bathroom in the first floor perfect for guests.Powder room, and private Study with double french door. Game room, media room, and 3 more great size beds in the 2nd floor.Pre/wire for surround system and video cameras. 3 car garage, water softener equipment installed, sprinkler system installed, and beautiful landscaping. Must see! DID NOT FLOOD!! 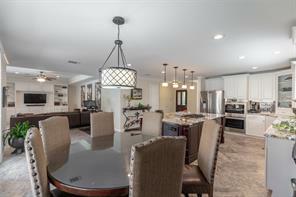 !Beautiful gated lock-and-leave community of 13 homes zoned to HUNTERS CREEK ELEMENTARY, SPRING BRANCH MIDDLE, and MEMORIAL HIGH SCHOOL by award-winning builder InTown Homes. First floor living, Formal Dinning Room, patio yard, and roof terrace. Master closet is a woman's dream ! Master Bath has Japanese TOTO heated bidet toilet. Chef's kitchen with white stacked cabinets, white marble countertops, and FisherPaykel appliances.Hardwoods throughout (NO CARPET). 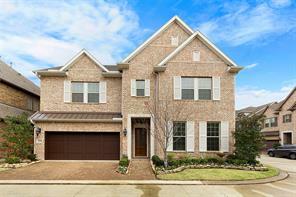 Stunning new construction in Spring Branch with fabulous upgrades throughout. Open & spacious downstairs living areas feature a grand reception at the foyer/stairway, Study with wall of wainscoting and hidden storage, Family Room open to Kitchen & Breakfast, Butlers Pantry w/ Wine Room. First floor Master Suite w/ Sitting area plus three Bedrooms with two baths upstairs. Gameroom and quality finishes abound. Welcome to Westview Terrace. A close in neighborhood with large lots and mature trees. The home has 4 bedrooms with first floor master, 3 additional bedrooms and game room up. 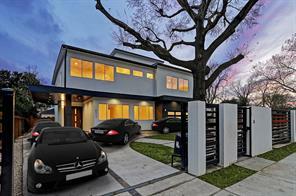 Only 5 years young, the property has many contemporary and current finishes that are in keeping with todays trends. Current owners remodeled and reconfigured kitchen with huge butcher block island, craftsman style cabinets with drawer banks and upgraded contemporary lighting. Wood floors through out with carpet in upstairs bedrooms only. Outdoor entertaining space is amazing with two sided fireplace, 19x14 covered patio with beadboard ceiling, stamped concrete and yard still large enough for a pool. Professionally landscaped and private. 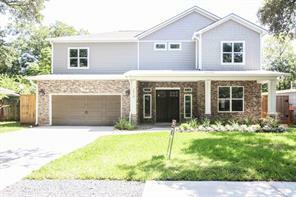 This beautiful new construction home has it all! Great location, great floor plan and a great neighborhood! Enter through the welcoming front porch and enjoy all the charm this home has. It will have interior brick details, custom wood walls, gourmet kitchen with Jenn-Air appliances (micro, dishwasher, double ovens, gas cooktop), oversized first floor master suite w/ 2 walk in closets, a walk through shower w/dual shower heads and a separate soaking tub. The first floor has hardwood flooring throughout! The family room has a gas log fireplace and 22 foot ceilings! The study could be used as an additional first floor bedroom as it has a 3/4 bath attached. The dining room has wainscoting and has easy access to the butlers pantry w/wine fridge and the kitchen. Upstairs there are 3 full bedrooms, an oversized game room, a bonus room, and another storage space with a secret door. Storage abounds in this home. There is also a covered rear patio. Expected completion date end of June. 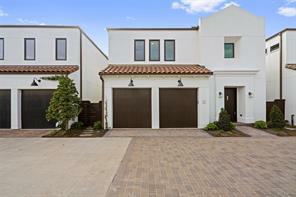 This amazing new construction has everything a discriminating owner could want. Builders attention to details and added features leaves nothing to compare to this Mediterranean special. With an expansive loggia and balcony overlooking the courtyard you have a huge private enteraining area. The yard in the rear is oversized and leaves room for an oasis of your design. The home includes a private retreat for guests or extended family which is completely liveable. The property has controlled access for privacy and will will provide the most in luxury and security. 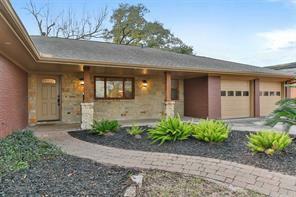 Expansive 5370 sq ft, 1 story home with updating done in 2012 on a half acre of property. This home has 2 complete kitchens, HUGE Master, 2 spacious secondary bedrooms, and no deed restrictions. Also has an approx 2000 sqf garage that is air conditioned with 3 garage doors. Beautiful new build homes, spacious and located on a quiet, convenient neighborhood. Exceptionally style with a large living areas and gorgeous finishes. This builder went all out with this new home. Custom fixtures & finishes, top of the line appliances. 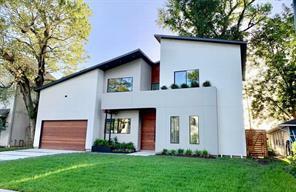 If you are looking for a one of a kind design home, come see 7316 Schiller! 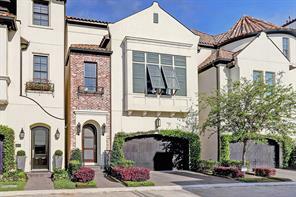 Rare opportunity to live in the prestigious Cunningham Parc gated-community offering luxury, detailed craftsmanship and tranquility. Completed in late 2017, this beautiful 3 bed 3.5 bath features panoramic views of Glenmore Forest Park and a front entry secluded from public view. The open floor plan, tall ceilings and beautiful scenic vistas offer a deluxe ambience. Elevator capable. Homeowners have customized many features including Control 4 operating system with in-ceiling speakers throughout, WIFI hot spots on each floor, custom drapery and shades operated by remote control, wide plank wood floors, interior brick wall accents, triple crown moulding, natural gas grill on covered patio, sound insulation in interior walls and floors, dry bar, 42” kitchen fridge, warming drawer, over-sized fireplace, abundant garage storage, and more (per seller). This one is a must see! 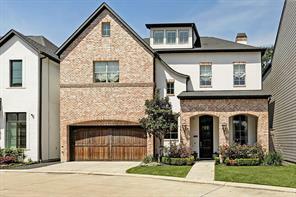 Stunning NEW CONSTRUCTION in Spring Branch. 4 Bedroom 3.5 Baths. Additional rooms on second floor can allow for 5 bedrooms. Impressive details throughout with honed granite, polished granite and marble and hardwoods. Mud room, butler's pantry leads you into a gourmet kitchen with eat-in bar and island. Fabulous space for entertainment and lots of natural light. Nestled in the Spring Branch area, 2018 Marnel Road offers high-end finishes and details throughout! This home offers 4 Bedrooms, 3.5 Baths, Covered Patio & an immense Backyard - 1st floor Study, Master Bedroom, & Utility Room. The spacious Master suite offers a private en suite bath and an enormous walk in closet with custom site built cabinetry. The completed home will feature 10' ceilings, recessed lighting, designer picked light fixtures, 8" baseboards, covered front and back porch, and hardwood flooring throughout. Will also offer natural stone counter tops, high-end custom site built cabinetry, 8' doors, and designer color scheme. The spacious chefs kitchen will feature a large kitchen island illuminated by designer selected pendant lighting, spacious pantry, and a high-end appliance package. Also offers mature oak trees, a professional landscape package, a sprinkler system, a large backyard with outdoor kitchen and plenty of room for a pool! Welcome to Afton Village Estates, another fabulous custom home project by Carte Blanche Builders! 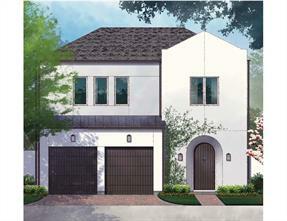 A development of 10 gated homes zoned to Memorial High School in a neighborhood setting. So convenient to everything. Front unit overlooking neighborhood. Large, open floor plan with custom finishes. 3 story with elevator to all floors. First floor en-suite bedroom and living area. Energy efficient. 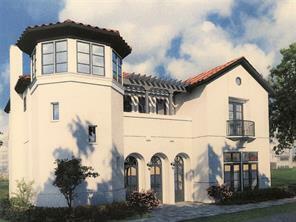 Stucco exterior with arches and side balcony, front and rear porches. Hardwood floors, high volume ceilings. 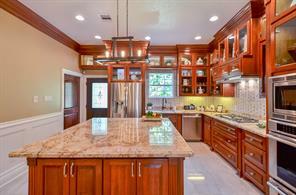 Huge gourmet kitchen with large eat-in island. Bosch appliance package, LED lighting. Destination master suite with his and her closets, Bain air bath. Utility room on third floor with bedrooms. DID NOT FLOOD!! 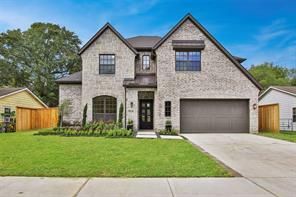 !Beautiful gated lock-and-leave community of 13 homes zoned to HUNTERS CREEK ELEMENTARY, SPRING BRANCH MIDDLE, and MEMORIAL HIGH SCHOOL by award-winning builder InTown Homes. First floor living, patio yard, and covered roof terrace. Master closet is a woman's dream (16 ft long)! Master Bath has Japanese TOTO heated bidet toilet. Chef's kitchen with white stacked cabinets, white marble countertops, and FisherPaykel appliances.Hardwoods throughout (NO CARPET). 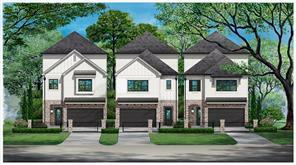 Perfect opportunity for a builder or investor to pick up a shovel ready project for 12 Townhomes in the highly desirable Spring Branch area. 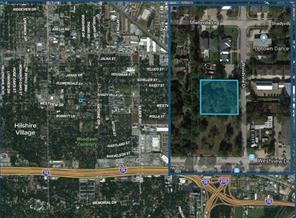 This 25,000 SqFt lot has been replatted and recorded for 12 lots. The approved Architectural, Structural and Civil Engineering Plans from the City of Houston are included in the sales price. New subdivision development are all around. 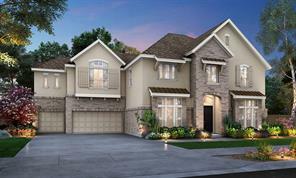 Home builders are InTown Homes, David Weekly, Lennar Homes, K. Hovanian and Talasek Builders to name a few. 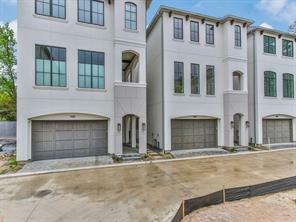 Operating Mini storage located inside Spring Branch neighborhood experiencing explosive new development. Center Bldg is cinder block, Outside "L" shaped Bldg is metal. Over 8,000 sq ft total, easily converted to Office Bldg with separate shop bldg. 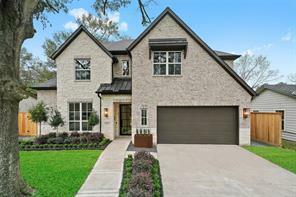 Located in a gated community consisting of just 28 homes zoned to Memorial High School, this new construction home offers high-end finishes including natural stone counter tops, high ceilings, wood flooring & casement windows throughout. Features Circa lighting, & high-end designer selected light fixtures. Chefs kitchen w/ a top of the line Thermador Appliance package w/ high-end cabinetry, soft-closing drawers, LED under cabinet lighting, subway tile back splash, SS dishwasher & Bosch microwave. Covered patio accessible through large sliding insulated glass doors! Full gutter system w/run off piped to the French drain system, Stucco & Hardi Panel Exterior, 2 car garage w/cedar garage doors, Alarm Pre-Wire, & so much more! **Note this home offers A LOT of upgrades including a central vacuum system, hard wood flooring in ALL Bedrooms, turf grass in the back yard. Builder is giving away **thousands** in free upgrades!!! Contact listing agent for more details!!! Never flooded. 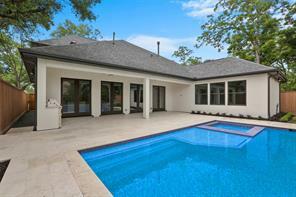 Elegant home tucked away in a private community with a 24/7 manned-gate and large pool. With new energy-efficient windows, premium white oak hardwoods throughout, 2-story foyer, 2 fireplaces, and a grand staircase, this home is undeniably luxurious. The large kitchen boasts new SS appliances, quartzite countertops, a spacious island, and high-end porcelain flooring. The open floorplan integrates the kitchen with the breakfast nook and den. Plenty of windows showcase the charming backyard which includes dozens of mature fruiting trees and shrubs and a low-maintenance brick patio. The private master suite has a seating area, walk-in closets, separate vanities, an oversized shower, and a jetted tub. A formal dining and living room offer plenty of entertaining space, while an office and laundry room complete the downstairs. The second story includes Jack & Jill bedrooms/bathroom with walk-in closets. The sizable game room features high quality built-ins. Spectacular home nestled in desirable Hunters Cove. Rare to find such a well-designed 5 bedroom home with a lovely, light-filled granite island kitchen. New Thermador convections ovens installed in '18. Hardwood flooring runs throughout the first floor. Family room features gas fireplace, built-ins, wall of windows, and French door giving access to the back yard. Pavered back yard surrounds a perfect cocktail pool with waterfall feature! You will love the spacious master suite with ENORMOUS closet! Second floor laundry, right where you need it! 2nd floor game room is a huge plus. New paint and carpet (3/19 per seller). Zoned to Hunters Creek Elem, Spring Branch MS and Memorial HS. Numerous private schools nearby including Regis, School of the Woods, Duchesne and Awty. HOA maintenance fee includes water/sewer, trash and landscaping for front yard. Truly a must see! This home isn’t just walls and a roof, it tells a story. 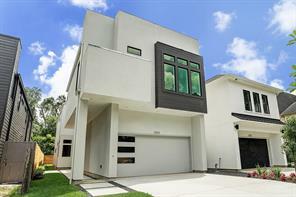 Newly-constructed 4 bed, 3.5 bath boasts unique design and creative architecture, saying a lot about the person living in it. spacious and airy with large rooms and lofty ceilings, it gives a sense of unrestrained freedom. Windows, abundant and atypical, provide natural light complimenting wonderous wood floors and native granite countertops. Front balcony, dual back balcony and covered back porch look out on a big, beautiful back yard. If your life is a story, start the next chapter here. OVERLOOKING POOL and PARK, this chic 3-bedroom, 3.5-bath home has SUNSET VIEWS with loads of natural light. GAME ROOM has 8' sliders leading to fabulous COVERED ROOF TOP DECK measures 13 x 13, making it the perfect entertaining area. INSTALLED ELEVATOR accesses all four floors. LIVING areas with 12' CEILINGS. Gorgeous selections and MIELE STAINLESS APPLIANCES. Move-in ready! Location, Location, Location....This is a rare find cozy 1 story home with 3 attached car garage, 4 bedrooms, 3 full baths and a large fully covered patio(sunroom) with a bonus of a Koi pond. Easy freeway access and NO HOA. Located in a gated community consisting of just 28 homes, this new construction home will offer high ceilings, natural stone counter tops, Circa lighting, wood flooring and casement windows throughout. A sizable Chefs kitchen feature high-end cabinetry, a large kitchen island and a high-end appliance package including: a 36" Burner Cook top, a Bosch wall oven, SS dishwasher & Bosch microwave. Will also features a covered patio with plenty of seating room, a full gutter system with run off piped to the French drain system and more! Beautiful new construction home by Quintessa Homes will include a full brick exterior with stone details & a custom 8ft front door. 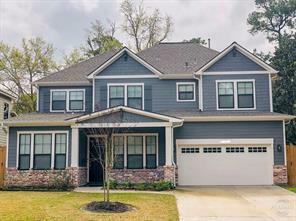 Home offers 4 Bedrooms, 3.5 Baths, a 1st floor Study, a 1st floor Master with private master bath & spacious closet, & a 2nd floor Game Room, Media Room & Seasonal Storage Closet. Home will feature high-end finishes throughout including recessed lighting, high ceilings, crown molding, high-end counter tops, custom site built cabinetry, outlets neatly tucked away in the baseboards, & hardwood flooring. Chefs kitchen will feature a large island with designer pendant lighting, spacious walk in pantry, under cabinet lighting & a high-end appliance package including a 36" Bosch Refrigerator, 36" Bosch 6-Burner Cooktop, 30" Bosch wall oven, a Bosch Dishwasher and more! Home also offers speaker pre-wire in the Dining Room, Kitchen, Master & Patio, alarm pre-wire, sprinkler system, lush landscape package, gutters tied in to the French drain system & so much more! 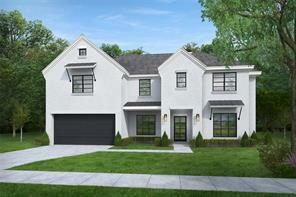 Stunning new construction under construction by award winning builder Cunningham Development. Highlights will include a gated front yard with automatic gate and additional driveway parking, as well as backyard green space. Exceptional floor plan design by Todd Rice that is ELEVATOR READY to each floor. Fabulous master suite that includes a large sitting area. All bedrooms with ensuite baths. Premium finishes such as Thermador/Bosch stainless appliances, Anderson windows, custom cabinetry, 11 foot ceilings on first floor, luxurious master suite. Superior energy package includes tankless water heater, touchscreen programmable WiFi thermostats, sound insulation between all floors, and much more. This free-standing patio home with private drive is located in a quiet, deed restricted community in Spring Branch zoned to Memorial High School, great location with quick access to I10 and 610 loop, entertainment, and shopping. The first floor has a large bedroom with attached bathroom, office/study nook with access to the patio and seating area in the backyard. The second floor is an open floor plan with hardwood floors. The kitchen has a large island with breakfast bar, LED recessed lighting ,stainless steel appliances, walk-in pantry, and a balcony off the kitchen.The living room has an open floor plan with hardwood floors, powder room, lots natural light, a fireplace, and a large dining space. The third floor features a laundry room with sink, a guest bedroom with attached bathroom, and the master bedroom featuring walk in his and her closets with built in shelving, dual sinks, mirrors with LED lighting, over-sized shower and bathtub. Back yard patio with access to green space. Nature Meets Nurture If you’re a lover of nature, this home will nurture your soul. Red brick façade disguises interior of modern elegance, fully illuminated by mother nature’s lightbulb. Natural materials make up the home’s many open spaces. Kitchen is both rustic and elegant with natural stone backsplash set off by high-polish countertops. You can hardly tell where the glossy bathrooms’ glass ends, and the quartzite begins. And, a house isn’t a home without hardwood underfoot, and this house is fully wood-floored. Located in a gated community consisting of just 28 homes zoned to Memorial High School, this new construction home will offer high-end finishes including natural stone counter tops, designer lighting, high ceilings, wood flooring floor and high-end casement windows. Will also offer Circa lighting and high-end designer selected light fixtures. Chefs kitchen will feature high-end cabinetry, soft-closing drawers and a high-end Bosch appliance package including: a 36'' 6 Burner Cook top, a Bosch wall oven, SS dishwasher & Bosch microwave. Will also features a covered patio with plenty of seating room, a full gutter system with run off piped to the French drain system and more! 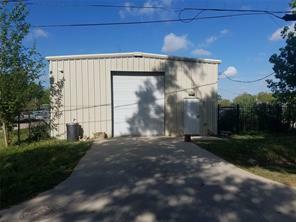 3600' (30 x 120) warehouse on just shy of an acre (40,160') ready for running a business or redeveloping as a new home community. Front unit is has 1/2 bath and office, back unit has 1/2 bath. Both units have 12 foot overhead doors and passage door. Two tract on the street just changed hands with one being developed as a private school and the other as a new home development. PRICE LISTED IS FOR LOT ONLY. 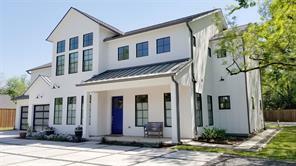 Buyer must use award winning Cunningham Custom Built Homes. Don't miss this opportunity to help with the design of your dream home on a 15,000 sq ft corner lot in the lovely Monarch Oaks subdivision. Zoned to the Spring Branch school district. View preliminary plans in photos above. 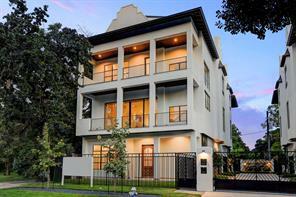 Experience upscale living in this classic/modern style home. Elegant features such as oak hardwood floors, granite countertops, a tankless water heater, and stainless-steel appliances highlight the attention to detail evident throughout the home. The travertine patio with cedar pergola make for a wonderful entertainment area to relax and appreciate the beautifully landscaped garden on an oversized lot. Enjoy unwinding and cooling off on those hot summer days in the stylish Italian designed above ground pool. With close proximity to I10, 610, and 290, this is the perfect location that allows easy access to many attractions and entertainment venues throughout the city. Beautiful new construction home by Quintessa Homes will include a full brick exterior with stone details and a custom 8ft front door. Home offers 4 Bedrooms, 3.5 Baths, a 1st floor Study, a 1st floor Master and a 2nd floor Game Room, Media Room & Seasonal Storage Closet. Home will feature high-end finishes throughout including recessed lighting, high ceilings, crown molding, high-end counter tops, custom site built cabinetry and hardwood flooring. Chefs kitchen will feature a large island with designer pendant lighting, under cabinet lighting and a high-end appliance package including a 36" Bosch Refrigerator, 36" Bosch 6-Burner Cooktop, 30" Bosch wall oven, a Bosch Dishwasher and more! Home also offers speaker pre-wire in the Dining Room, Kitchen, Master & Patio, alarm pre-wire, full front & back sprinkler system and gutters tied in to the French drain system. SIMPLY THE BEST! 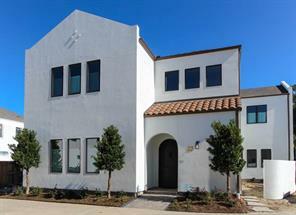 Beautiful recent construction on a corner lot in WESTVIEW TERRACE. This home is loaded with upgrades. You’ll LOVE it the moment you open the front door! Custom Lighting*Extensive Rich Solid Wood Flooring*Dramatic Hardwood Staircase*Stunning Two-Story Den w/Wall of Floor to Ceiling Windows*Fireplace*All Open to an INCREDIBLE oversized island kitchen w/breakfast bar, Study with French Doors, Master Suite w/Vaulted Ceilings Down. Three Bedrooms Upstairs w/Game Room & Media Room. Location & Style. Minutes to Great Schools, Shopping & Restaurants! Don't forget to click on the 3D Virtual Tour link and walk thru the home! 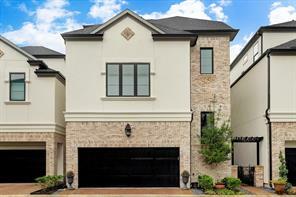 Least expensive home available for purchase in luxurious gated community of Ravenna. Ravenna offers a lock-and-leave environment in the heart of Spring Branch, just minutes from Downtown, the Energy Corridor, and the Galleria. Home has remarkably spacious room sizes with high ceilings and lots of natural light. Kitchen equipped with high-end Miele stainless steel appliances, wood flooring throughout, and gorgeous interior selections. This fabulous value won't last long! Both Parcels are listed for $700,000 total. Property on the lot is tear down. DO NOT ENTER. 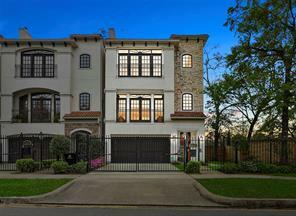 LUXURIOUS remodeled 3 story Traditional Brick Home nestled in desirable small gated community of HUNTERS COURT. 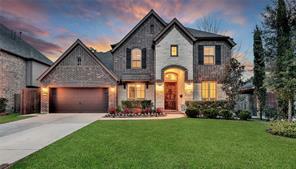 Impeccable location zoned to award winning Hunters Creek Elementary, Spring Branch Middle & Memorial High Schools. 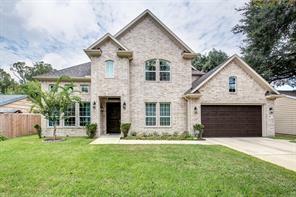 Open concept MAIN FLOOR LIVING area, plantation shutters, gas fireplace, custom built-ins, refinished hardwoods, NEW Quartzite kitchen counters, island, SS appliances & tons of storage. Enjoy the abundance of natural light & serene views through large windows/French doors, spacious brick patio surrounded by english garden. Owner's Retreat, 2nd LA, additional bedrooms & utility room located on the 2nd floor, fantastic 3rd story suite/ private BONUS/media ROOM/office, New fixtures throughout, 2 Car garage has extra 110 & 220 volt outlets w/ additional private parking on side, NEW Roof, New Landscape w/ irrigation system. 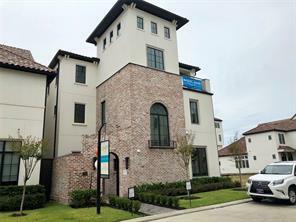 Designed to accept elevator*NEVER FLOODED -Per Seller Close to I-10 minutes from Downtown, Galleria, Energy Corridor & Memorial Park/Golf Course. Custom built, new construction built to high standards. Spacious 4 bedroom fronting onto prestigious Janak Drive. Soaring ceilings, natural stone tiles, state of the art fireplace with honed stacked stone in great room, generous chef’s kitchen with custom made cabinets, high grade granite bench-tops including extra-large island with wine fridge, indoor/outdoor flow onto large 24' x 12' elegant patio, wood ceiling, travertine floors, built-in gas grill and 48 bottle wine-fridge. Spacious master bedroom with balcony, large designer closets, natural stone showers, custom built cabinets, porcelain countertops with granite in the kitchen. Guest suite upstairs w/ private bath. Mud room, media/game room with large closet. Double sized wood garage doors with detail plus 2 additional visitor parks. A very private palm tree line fenced in rear yard. Irrigation system, owned alarm & wired for speakers & TV inside/out. Chandeliers, multiple lights, & plugs. 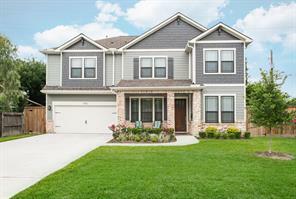 Must have this beautiful completed home! Beautifully remodeled in 2016 and lovingly maintained. Conveniently located in highly sought after Monarch Oaks, this one story home sits on a 13,500 SF lot with a backyard paradise! Featuring an enormous kitchen island, gorgeous natural stone countertop with marble backsplash and a sleek Wolf gas range. The home also offers raised coiffured ceilings, hardwoods and tile flooring, no carpet throughout. Per seller, home was taken down to the studs. Zoned to Valley Oaks Elementary and Memorial High School! Welcome to this attractive lock≤ave 2015 home by Giorgio Borlenghi. One of 11 homes in gated community just north of I-10. Located on a corner lot, allowing you private access to a nice side yard that is HOA maintained & allows for an abundance of natural light throughout. Plenty of visitor parking and a green space that adds a tranquil aesthetic to this professionally landscaped complex. The open concept living has designer features - hardwood floors, Viking appliances, wine cooler, soft-close cabinets, gas outlet on patio, and current grey color scheme throughout. Entertaining on the first floor is flawless with the living, dining, kitchen, powder bath, wet bar, & gracious covered patio with plenty of yard for a pet. Second floor boasts the master w/ access to a relaxing patio, two en-suite large bedrooms, game room, and study (current homeowner using as small media room). 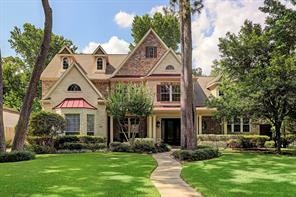 Great location for many private schools close by, downtown & energy corridor. A must see! 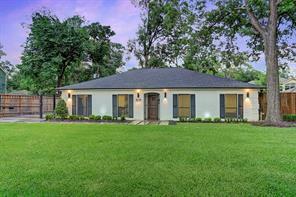 Wonderful new construction in Spring Branch close to town! Open kitchen to family room, dining room has beautiful cross beam accent and bead board. Kitchen features stainless steel appliances, walk in pantry, large island with plenty of seating, and wine bar with glass front cabinets and wine fridge. Small study off kitchen provides the perfect place for working. Game room and utility room upstairs. Master has wood flooring, walk in closet, double sinks, separate shower and tub, private water closet. Guest bedrooms also have walk in closets. Large sized backyard is great for entertaining, this neighborhood is in a great location offering easy commutes. Ready for you to move in by summer! 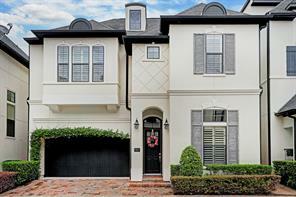 Beautiful home located in the gated Lynnview Manor. Features a wonderful downstairs living/entertaining space with plenty of natural light, high ceilings, linen shades and an open kitchen. Custom built-in bookshelves surround the hearth & gas fireplace. Spacious open kitchen has an enormous granite island with plenty of seating. Includes a study/office nook off the kitchen area. Heating/Cooling system features Hepa Air Purifying filters. First floor looks out to the covered patio and backyard. Second floor has 3 bedrooms including a kingsize master bedroom with vaulted ceilings, large bathroom, & walk-in closet. Also includes cozy family room off of the master. Third floor is a large bonus bedroom with 2 closets and full bath. 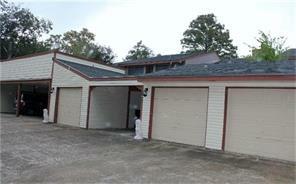 The 2 car garage has an extended driveway allowing for additional parking on the property. Great use of every space in this elegant home! 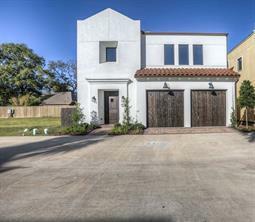 Spring Branch-4 bedroom 3.5 bath 2 car attached garage recent construction(2015)2 story single family home (3594 square feet) on an over sized 4014 square foot patio home lot. First floor Living/Dining room, Kitchen, en-suite guest bedroom, wet bar area plus 1/2 bath. 4"Hardwood Floors, High Ceiling, Crown Molding,Gas Log Fireplace, Built-ins.Marble Island Kitchen with high end stainless steel Thermador appliances including a built-in refrigerator, gas cook top,electric oven and dishwasher. Soft close cabinets & drawers, under counter lighting and a huge walk in pantry.2nd floor master suite w/study, spa like master bath with double vanities, frame-less glass shower + soaking tub. His and her closets! Game-room plus 2 additional guest bedrooms w/a jack and Jill bath + utility room.Light and bright interior with numerous double pane windows and glass French Doors.Two outdoor living spaces + side yard.Private driveway and NO HOA. Zoned to Memorial High School! 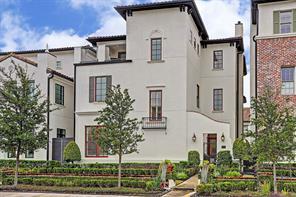 Motivated Seller..
OPPULENCE AND SOPHISTICATION PERSONIFIED... Limited desired B Floorplan semi-custom French style home in gated community overlooks green space & water feature. Multiple upgrades throughout such as gourmet kitchen with rare, beautiful "metalicus leather granite", Miele double ovens & LG touchless glass refrigerator! Master bath in generously sized Owner's Retreat boasts Carrera marble walls & flooring; the boutique style closet system is a must have!! Elevator-capable, premium paint throughout, all bathroom walls fully tiled, wood-like tile; no carpet in this home! First floor living means no carrying groceries up the stairs! Too many upgrades and features to mention; WiFi garage door openers, surround sound speakers, electronic blind are just a few! It's time to schedule an appointment to see this stunning residence in person... if you have discerning taste; this is the one!!! 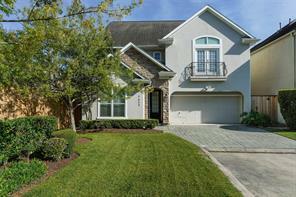 Elegant David Weekley home in the gated community of Lynnview Manor. Magazine quality elements abound throughout this move-in ready home. One of the largest floorplans boasting first-floor living with transitional flow through living and dining areas perfect for gatherings and entertaining. Hardwood floors, high volume ceilings. Gourmet eat-in island kitchen with upgraded granite, cabinets and custom lighting. Custom dry bar with wine chiller and glass front cabinets, custom hardware. Grand master suite with adjacent sitting room. Spa-like master bath with super shower, oversized walk-in master closet. Third floor features multi-use home gym, sewing or craft room. Backyard with covered patio finished with flagstone for low maintenance. 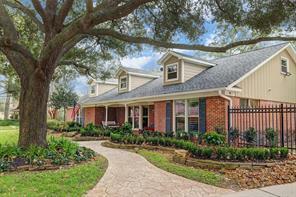 Nestled in the Monarch Oaks neighborhood for bike rides or walks, zoned to SBISD schools. Private pool for residents. 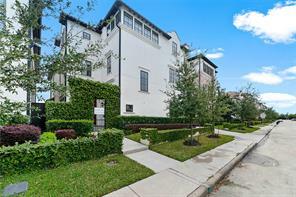 Excellent central Houston location for minutes commute east into downtown or west to Energy Corridor, Galleria.